Congratulations to the 14u Snowbelt team for winning the JAM this weekend. What a way to end the Snowbelt season!!!! 10u Team Yockell are Snowbelt Champions!! 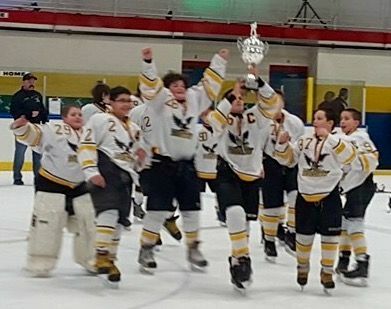 Valley Peewee Major (2004) Wins Sectionals! 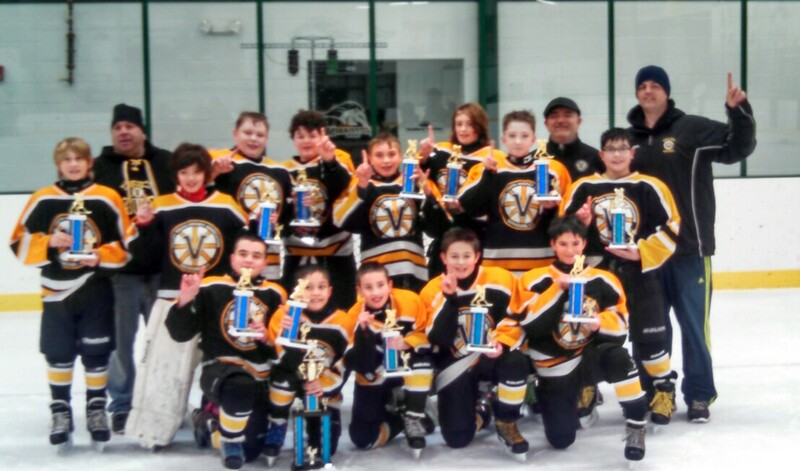 CONGRATULATIONS to Valley's Peewee Major (2004) team on winning Sectionals today! They are going to STATES in 12 days!! 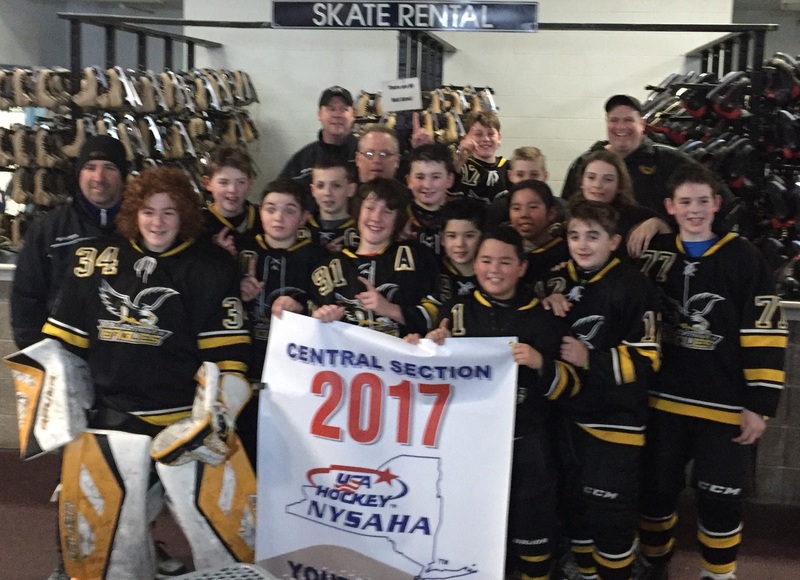 Valley was undefeated in these playoffs so the 04s will be the #1 seed from Central Section going to the NY State Tournament. It was a long slog playing 22 Q games (winning 19! and two ties!) against the other 11 teams in Central Section's Tier II division. Good job, peewees! Valley's Girls 14U:Tier I team will also be competing at States this coming weekend, March 9-12. Good luck, Valley teams. GO VALLEY! Welcome back, Spencer and Gabe! We are so proud of you! Valley Girls 14U win their second tournament in a row. This time the London Devilettes 27th annual Tournament of Heros bantam A division. Going 4-1-1 against some of the best teams Canada has to offer. Bantam 02 Travel Are Challenge Cup Champs! 2017 14U Girls Tier 1 Harbor Center Cup Champions! Team Spirit Tuesday is TODAY! Wear your Valley jerseys TODAY -- new, old, vintage, practice, or camp -- and send us pix! Or post one on Valley's Facebook page. All players who send a photo will be entered in a drawing for a Valley baseball cap. And come out and cheer the Syracuse Cougars v. Fulton tonight -- 7pm @Meachem Rink. Go Cougars! 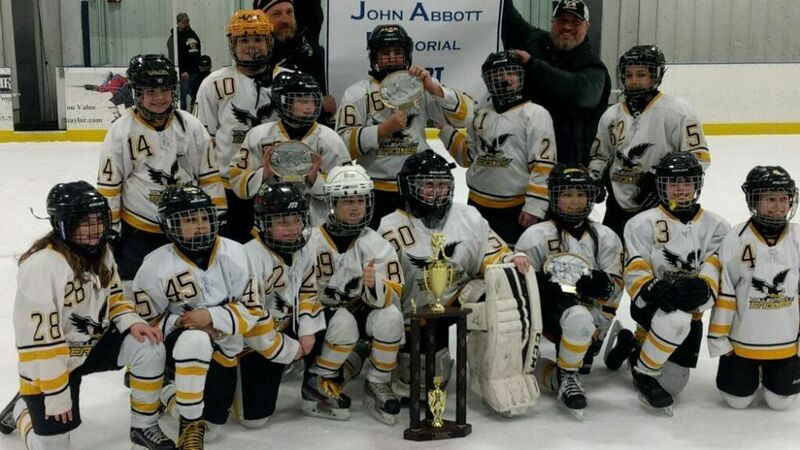 Squirt 07 Wins Dickens Tourney! 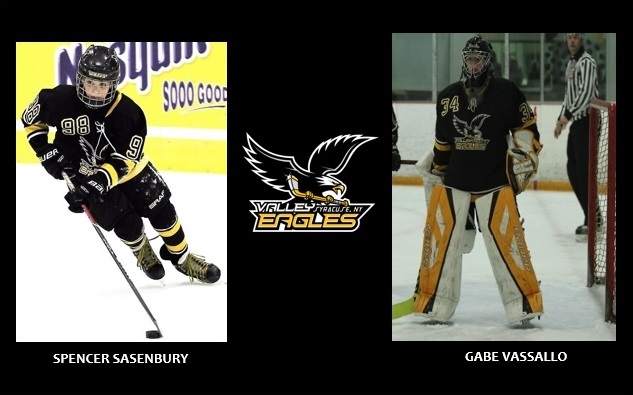 Valley Eagles Players to Play in Quebec Intl. PeeWee Tournament! Turkey Tourney Blue Division Champs - Team Smorol! Way to go, Team Smorol! Colgate's men's hockey team hosted Valley's 2004 and 2005 peewee travel teams (plus other assorted Valley players) Wednesday evening for a fun hour of skills and contests. Kodi Dotterer (2003 Bantam Major) won the hurdle jumping competition (view HERE), and Wade Weil (2005 Peewee Minor) was the last survivor in the puck gauntlet (photo below). Many thanks to Coach Harder and the Raiders team!! 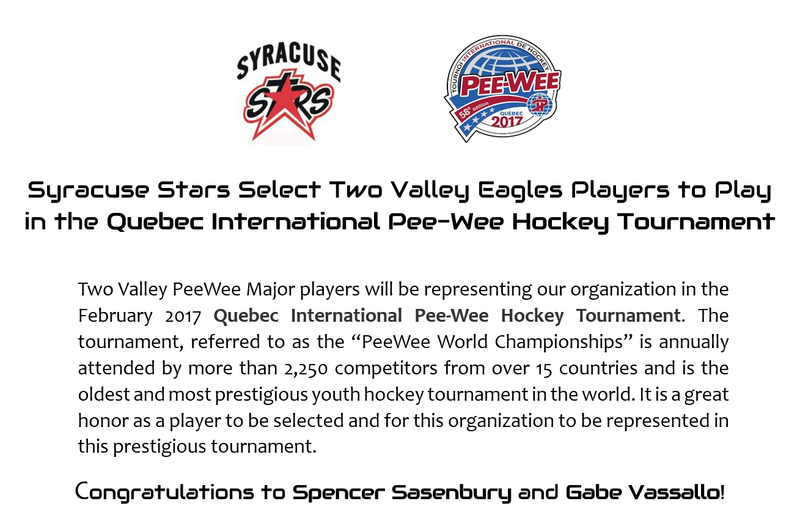 Congrats to Valley Peewee Minor (2005)! 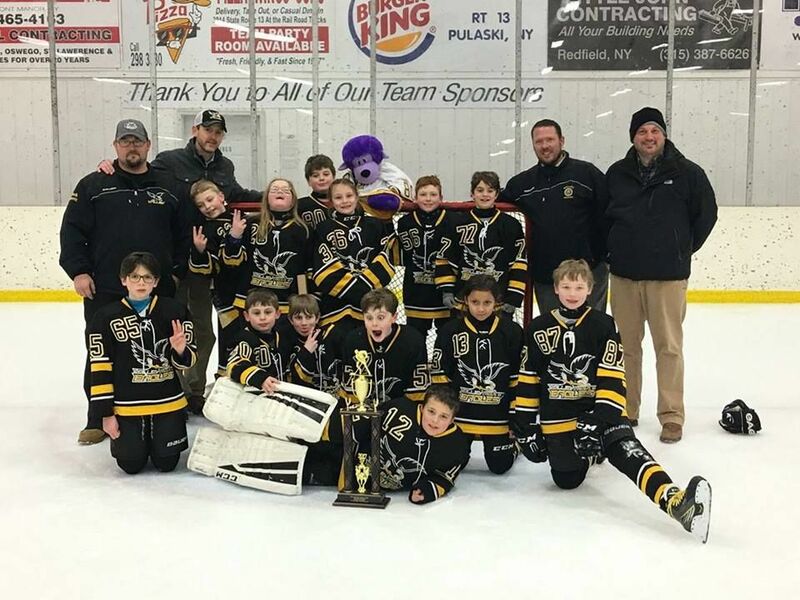 Valley Peewee Minor (05) stiffs their guests for the second year in a row and wins the championship in their own tournament, Pumpkin Power Play... Congratulations, 05s!! The competition was truly ferocious -- a lot of exciting hockey this weekend. Congrats to all participants in this tournament! 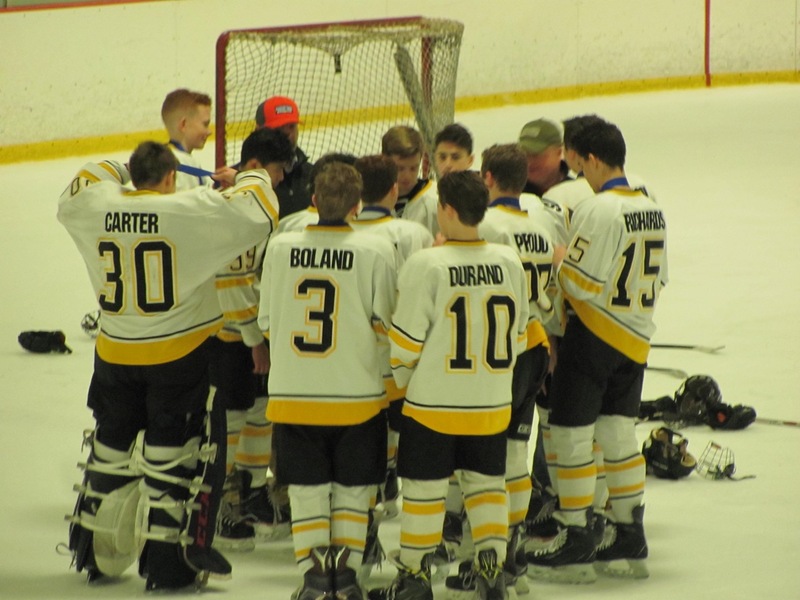 The appeal below was published on Tuesday morning and within 10.5 hours, we met the goal of raising $1130 to re-outfit Connor Boland for hockey. 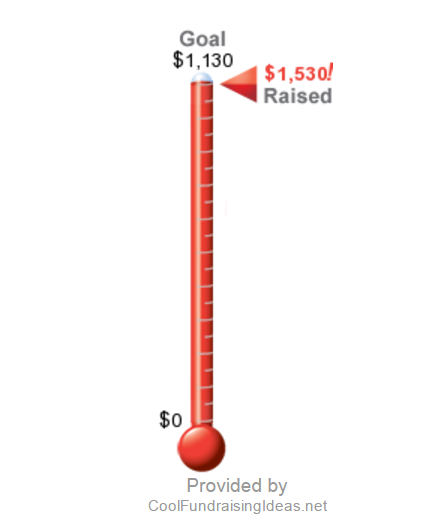 26 hours after the appeal, the amount donated was $1505! A quick look at the Boland GoFundMe page shows many Valley family names, too. Way to go, Valley! Valley Bantam, Connor Boland, lost his home, cats, and all of his hockey gear on Sunday, June 26. Please help get him re-outfitted for hockey! He will need EVERYTHING. He also needs it ASAP as he is supposed to be at a tournament in a week. Valley will transfer any donations directly to McKie Sports. If we collect more than necessary to replace Connor's gear, the remainder will go to his family for their other needs. *Since Garth Werner was elected as Director of Referees, his Board seat will be filled by the 4th place At Large Board candidate. 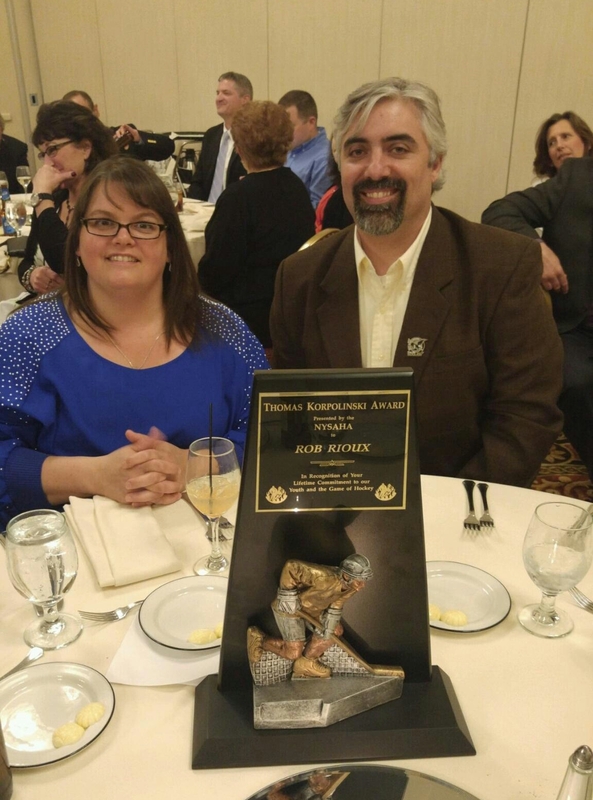 Rob Rioux is this year's winner of the NYSAHA Tom Korpolinski Award! 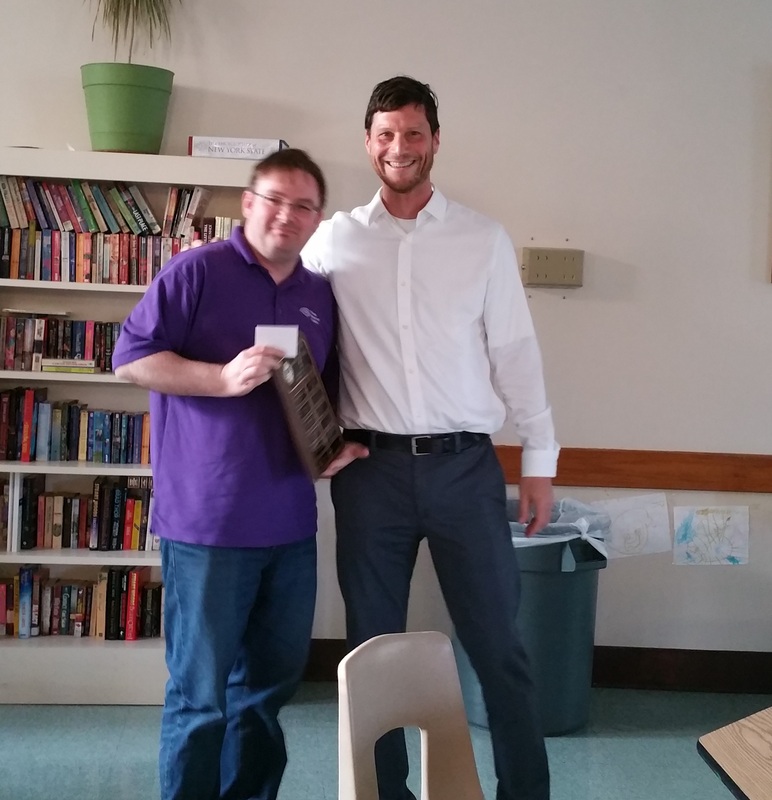 This award is presented annually since 2000 to an individual who has served at the “grass roots” level within the District and exudes the qualities and level of commitment to the sport that Tom so humbly possessed. For more history and the past winners follow link. Valley Youth Hockey is excited to announce Blair White as the Bantam Major (2002) coach for the 2016-17 season. Blair spent the past two seasons coaching Valley Snowbelt teams. Prior to that he coached Fulton's midgets to a state championship and brings extensive experience as an assistant and head coach with the Syracuse Stars junior and bantam programs. 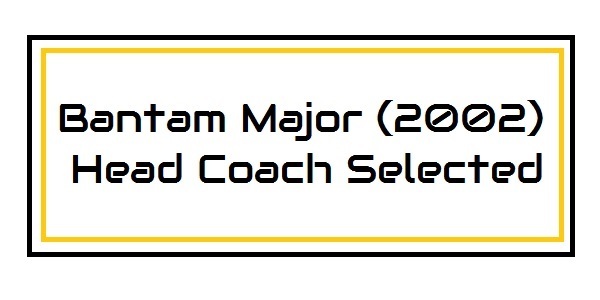 Additional tryouts for the Bantam Major 2002 team will be scheduled shortly. Stay tuned. On behalf of our Board of Directors I want to thank you for choosing Valley Youth Hockey this season. I’m proud of another season where kids got an opportunity to participate in this great sport of hockey. Not only did Valley’s 12U Girls team repeat as State Champions, our Pee Wee Major 2003 team and 18U Midget team represented Valley in State Championship tournaments. We also helped to introduce kids to hockey and skating through our Initiation team and First Strides program. We provided a recreational hockey experience for kids who may be getting a later start or are coming back to hockey after a few years with our First Goals program. 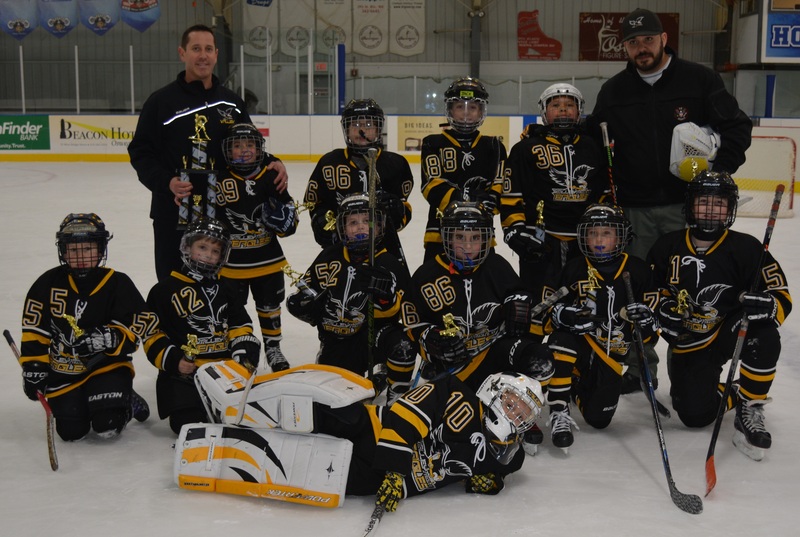 Our players had fun and finished the season strong at Snowbelt Jams and year end tournaments for travel teams and mites. Help us continue these efforts by considering running as a Board member or other volunteer positions. Valley Youth Hockey’s Annual Meeting and Election takes place on April 20th, 7pm at the Cecile Center(located across from Meachem Rink). We are accepting nominations for the following open positions: President, Secretary, Director of Referees, and 3 At-Large Board members. Anyone who is interested in a board position can send me an email at . We ask that you complete a brief profile of yourself and your interest in the position to be posted on our website under Nominee Bios. Any questions about the specific duties can be fielded by me or other board members. 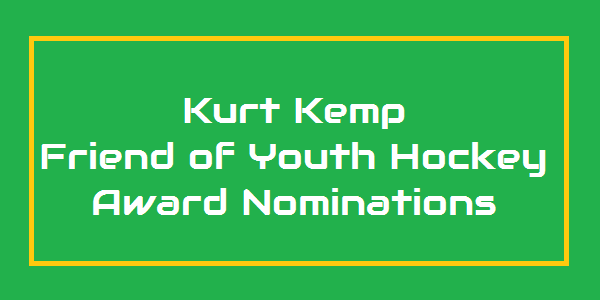 Since 2010 we have honored individuals who exemplify a spirit of dedication and commitment to youth hockey with the Kurt Kemp Friend of Youth Hockey Award. Kurt is a retiree of the City of Syracuse Parks Department and in addition to running the Meachem Rink; he coached and served on the board for Valley. Past recipients are Robin & Mike Thompson, Bill Eccles, John Brienza, Pat Karins, Dave Ogden and Rob Rioux. Nominations can be made to any Board Member prior to April 15th. 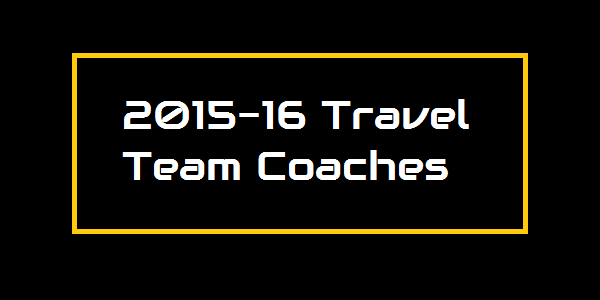 Please give us feedback by taking the time to complete our end-of-season coach evaluations. 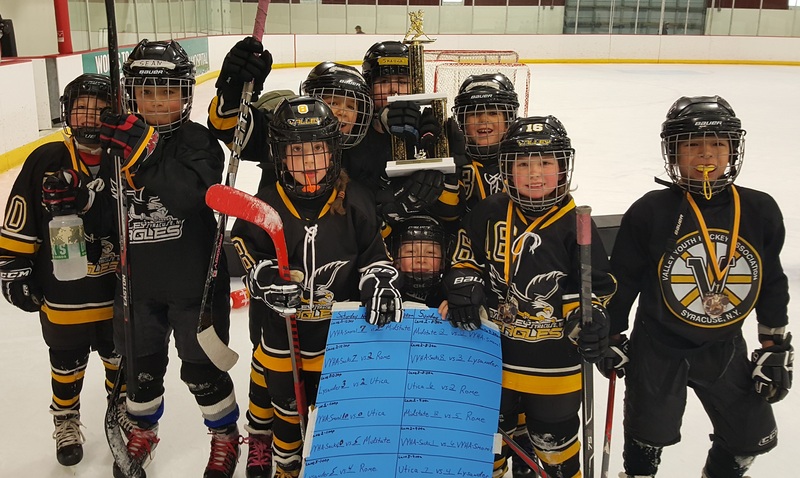 Spring Hockey: There are still openings for Valley players to participate in spring hockey sessions at Meachem on Saturdays for the remainder of April. Please see details and register on our website. Thank you to everyone who volunteered their time or contributed to our fundraising efforts or sponsored a team/tournament. Without you the price of hockey would have increased substantially for Valley kids over the past couple years. Crunch Players Give PW03 a Workout! 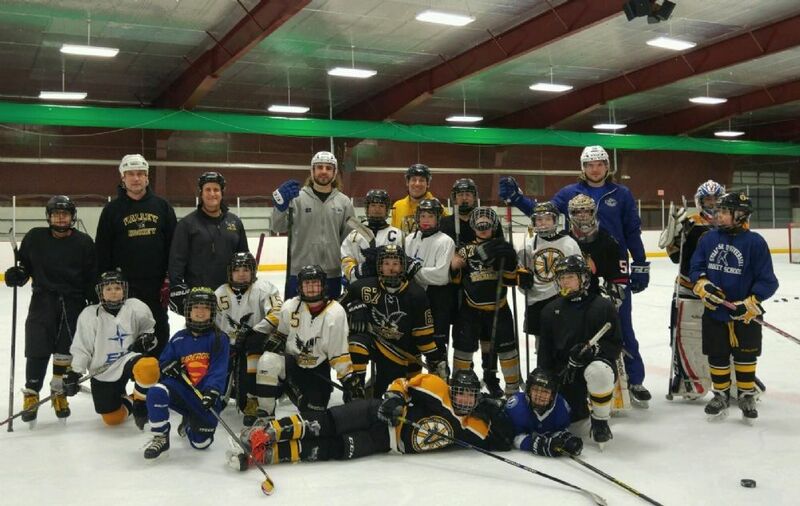 Syracuse Crunch players Luke Witkowski (grey sweatshirt) & Tye McGinn (blue Crunch warm-ups) visited Valley's Peewee Major team at Meachem Rink today and played some pond hockey with them. Thank you for visiting, Luke Witkowski & Tye McGinn!!! Go Crunch!! 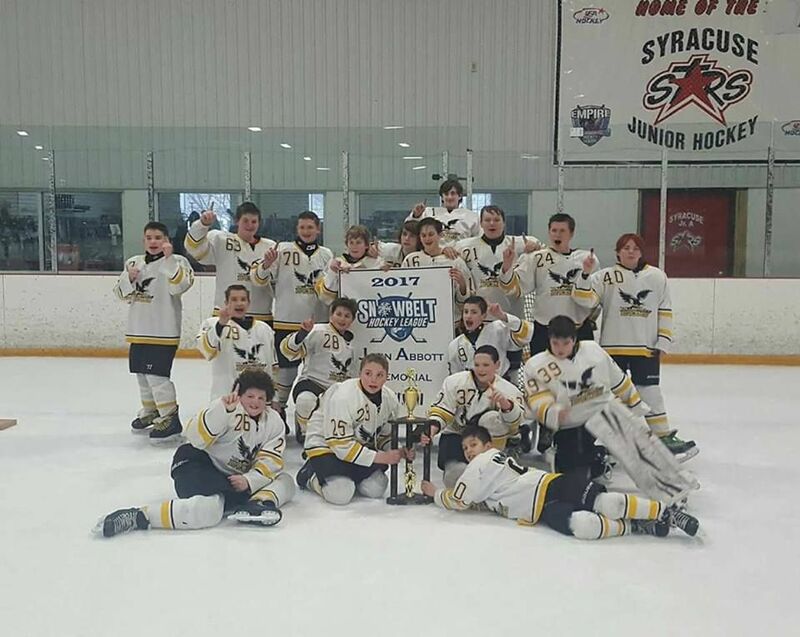 Squirt Major Wins CNY Squirt Showdown! "They played great and won all their games, took most of the points and had 2nd most points overall." Kudos to our bantams! 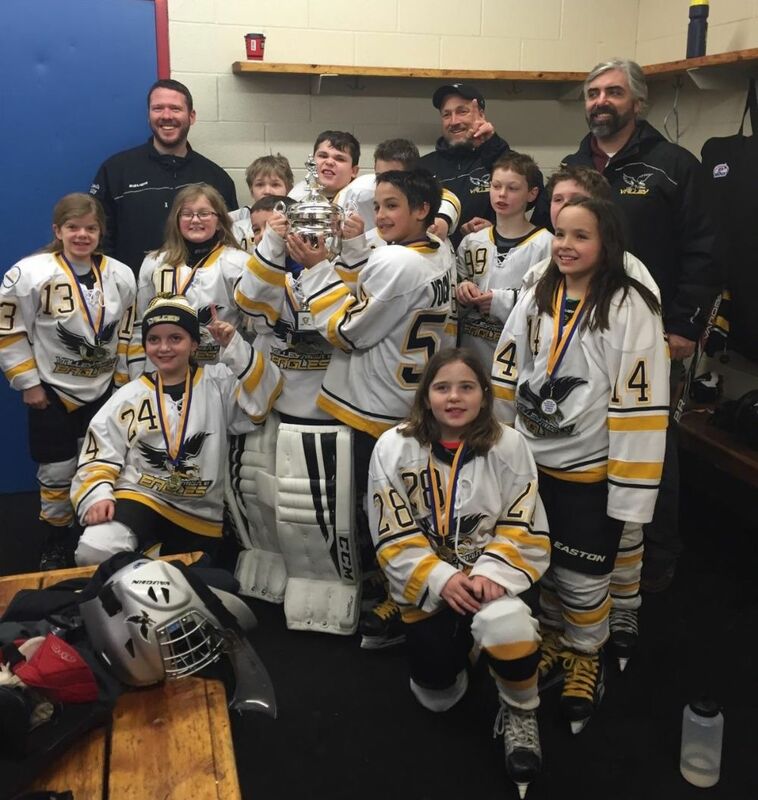 Peewee Champion -- Finalists in Perinton! Squirt-Graf -- Finalists in Perinton! Team Pelsue Wins Boulter Classic, Peewee West Division! 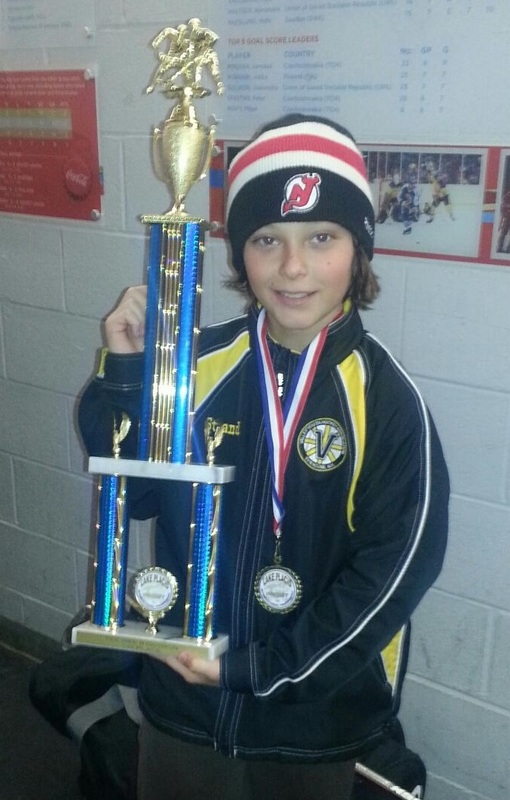 Congratulations to Valley Peewee Red (Team Pelsue)!!! Unbeaten in the tournament, Peewee Red defeated Webster-DeVries 3-1 for the Boulter Classic championship! Nice finish to the season, peewees. 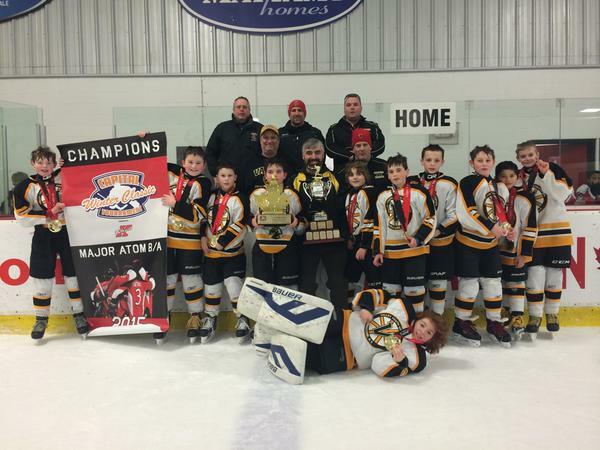 Team Rioux Wins Boulter Classic, Squirt North Division! the space of one week, and a 12-game winning streak. Go Valley! Go squirts!! Valley Girls 12U Team Wins States! Again!! 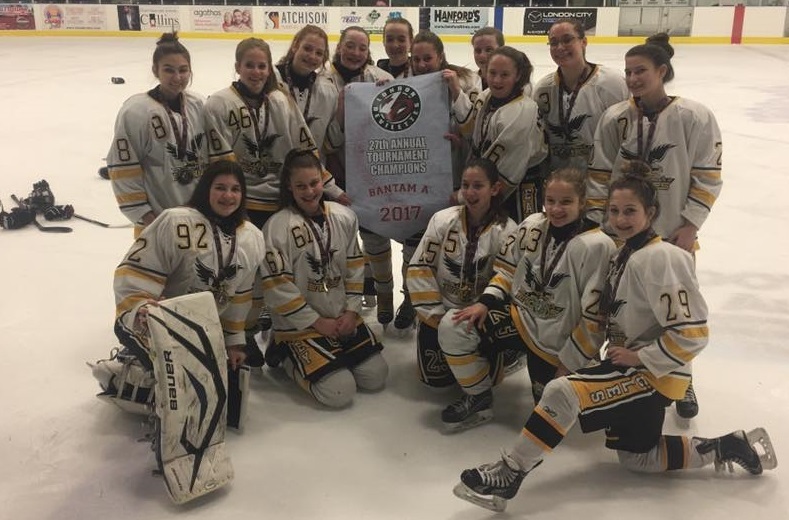 Congratulations to Valley's Girls 12U:Tier I Team on winning their New York State tournament games for the SECOND year in a row! 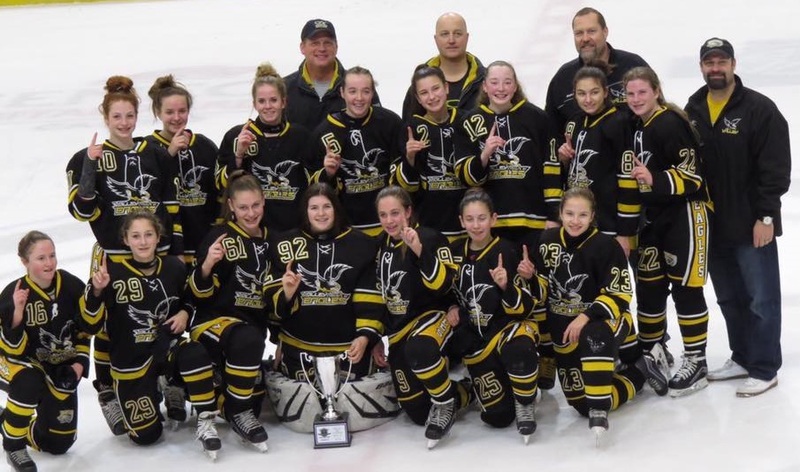 Good luck to our champions in the 12U Girls National Tournament at Assabet Valley in two weeks! 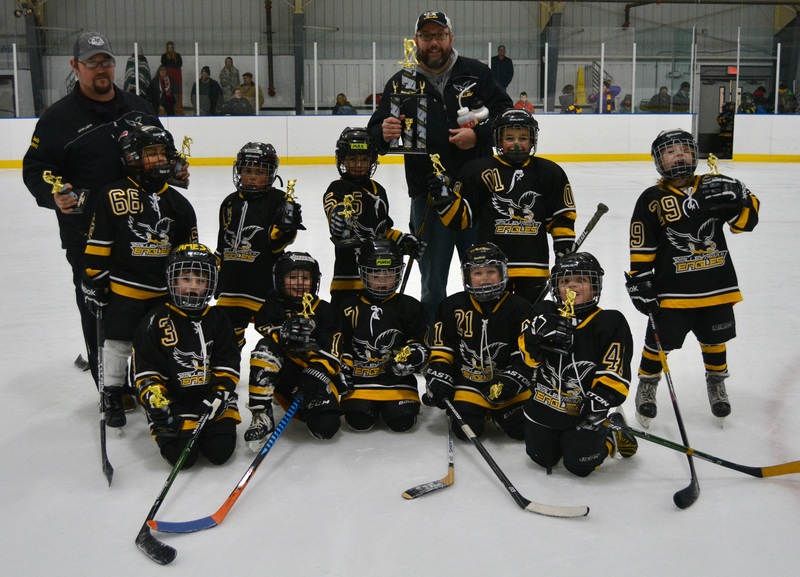 Squirt White 1 (Team Rioux) Wins Snowbelt JAM Tournament! 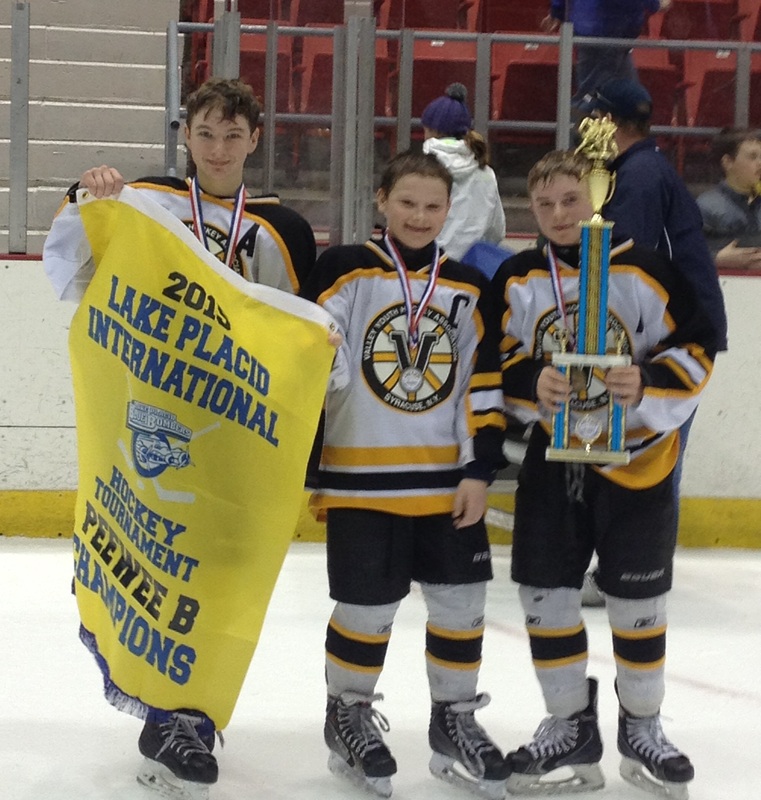 Peewee Minor Wins Lake Placid Tournament! 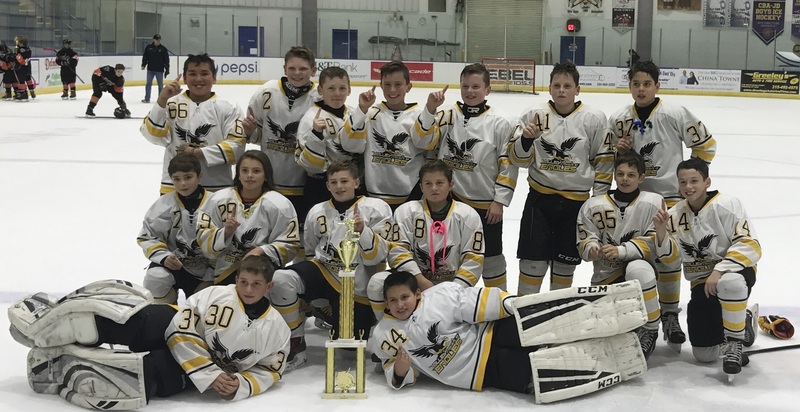 Congratulations to Peewee Minor (04) on winning the Lake Placid International Invitational Hockey Tournament, Peewee A division! Peewee Major Wins Central Section's Sectionals! Peewee Major is going to States!!! 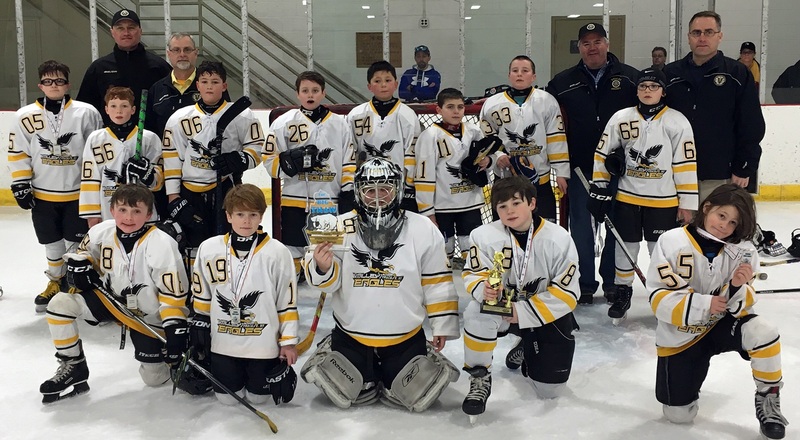 The Valley Youth Hockey Association is a Tier III program under USA Hockey and the Central Section of the New York State Amateur Hockey Association (NYSAHA). There are three Tiers in youth hockey: I, II and III. To most youth hockey teams, Tier status is irrelevant. 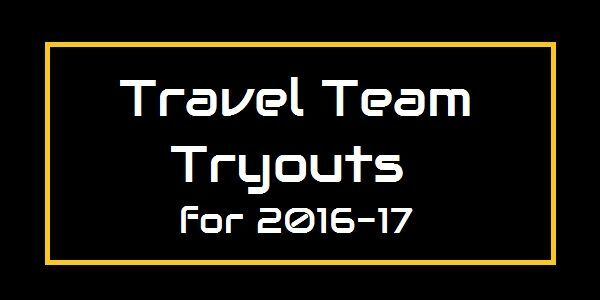 To state-bound travel teams in Midgets, Bantams and Pee Wees, Tier status determines the teams that you play in Q games (qualifying games) to advance and qualify for State Tournaments. To most Snowbelt, Squirt and Mite teams, Tier status has little or no influence on the teams you play, etc. In general, Tier I is for large Associations that have teams that want to compete at the highest level. The only Tier I Association in Central Section is the Nationals. Tier II Associations are in general, medium sized and play their competitive hockey at a high level. Examples of local Tier II Associations are Camillus and Lysander. Tier III is reserved for the smaller Associations. Associations sometimes change their Tier status. For example, Lysander was originally a Tier I Association that then changed to a Tier II Association. There have been several discussions at Valley over the years about requesting Central Section to reclassify us to a Tier II Association. There are pros and cons to this and different opinions within the Association. The Board of Directors has scheduled a meeting on Tuesday February 23rd at 6:30 pm at the Clary Middle School Auditorium at 100 Amidon Drive in Syracuse to let the general membership of the Association express their thoughts on Valley becoming a Tier II Association for the 2016-17 season. If you would like to contribute to this discussion, please attend the meeting. The meeting will consist of a brief presentation followed by Board Members listening to the general membership on Tier status. A decision will not be made at the meeting. The purpose of the meeting is for Board Members to receive input on changing to Tier II. If the change occurs, it will happen at a future Valley Board meeting. 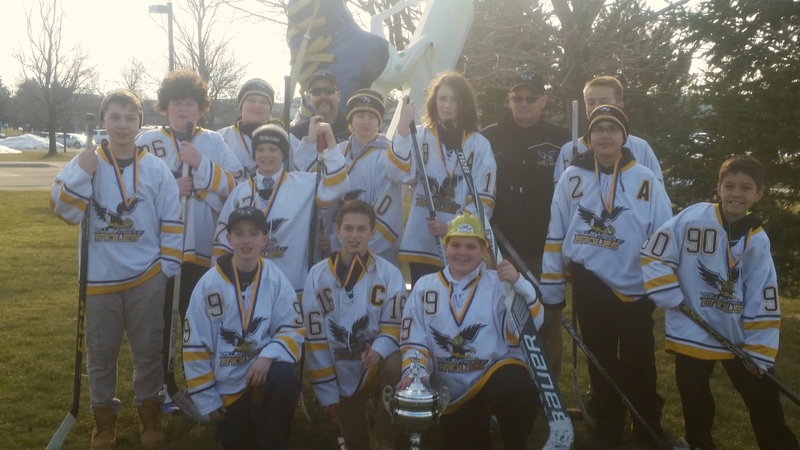 Peewee Major Wins OYHA Thunder Rumble Championship! Valley Girls 12U (Tier 1) Goalie, Breese Burlingame, from Binghamton NY has been selected to play on an International Select Hockey team traveling to Stockholm, Sweden and Helsinki, Finland this spring to participate in an all-star tournament and educational tour. This experience is a once in a lifetime opportunity for Breese to take her hockey talents to the next level and provide cultural exchanges with peers from all over the globe. 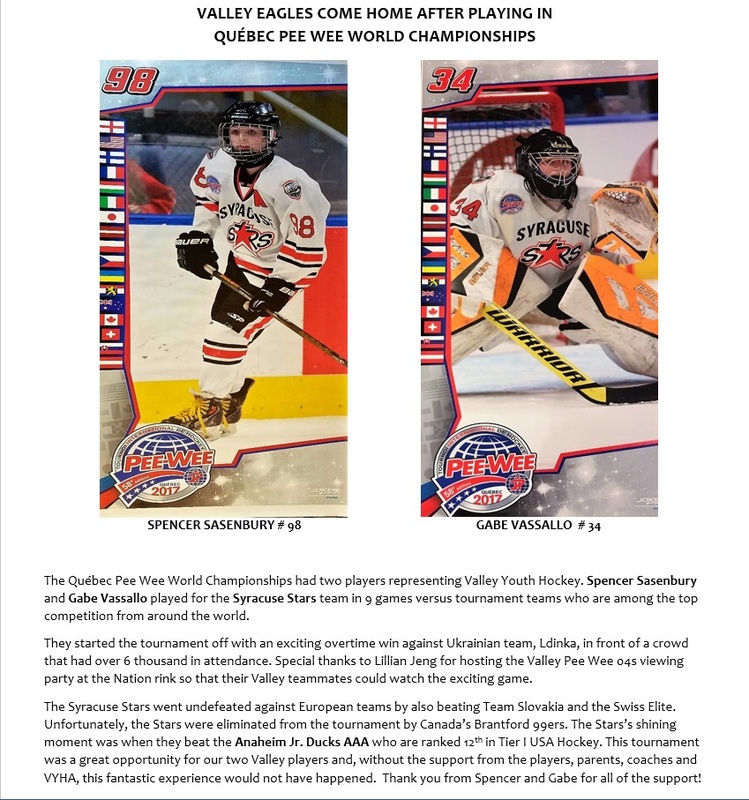 They are participating in the World Selects Hockey Invitational featuring teams from USA, Latvia, Canada, Switzerland, Sweden, Russia, Norway, Czech Republic, Slovakia and Finland. In addition to the hockey portion of the trip, the team will spend time touring the cities, visiting museums, castles and other historical landmarks throughout each city. 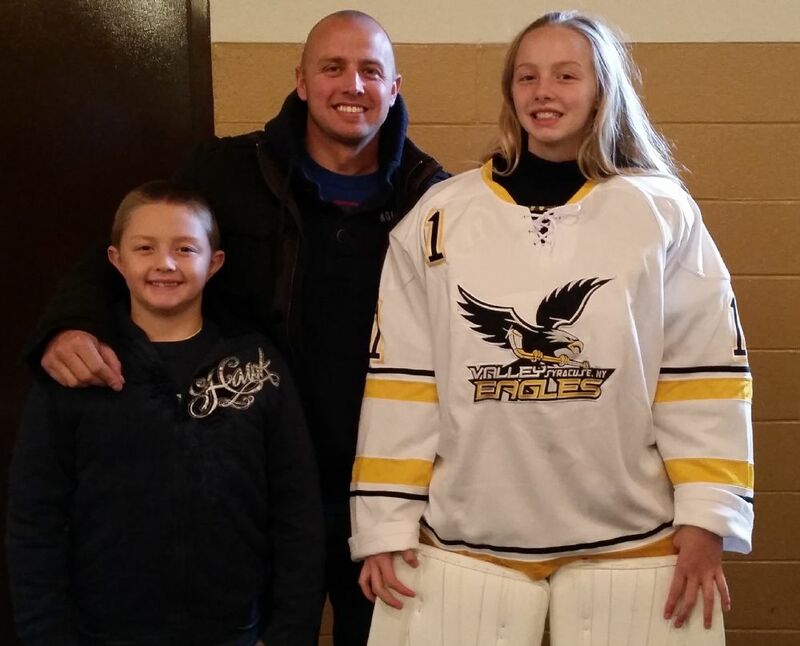 Help Breese Play Hockey in Sweden & Finland! 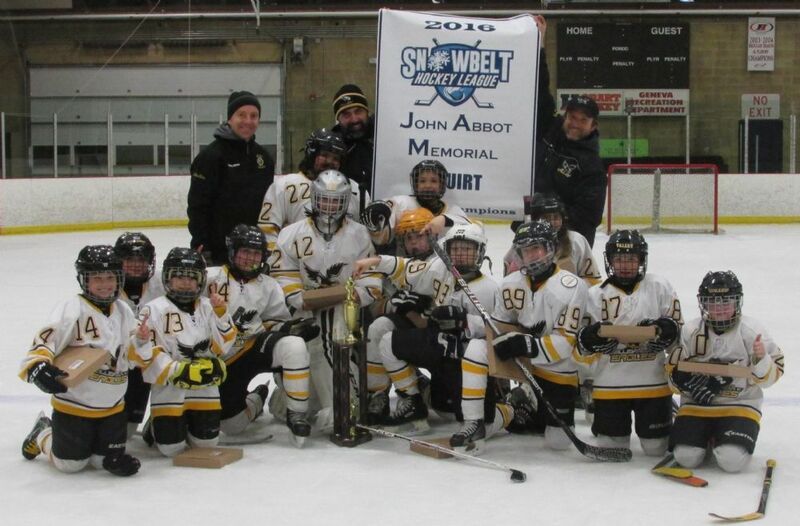 Squirt-Graf Wins Silver Stick Championship! 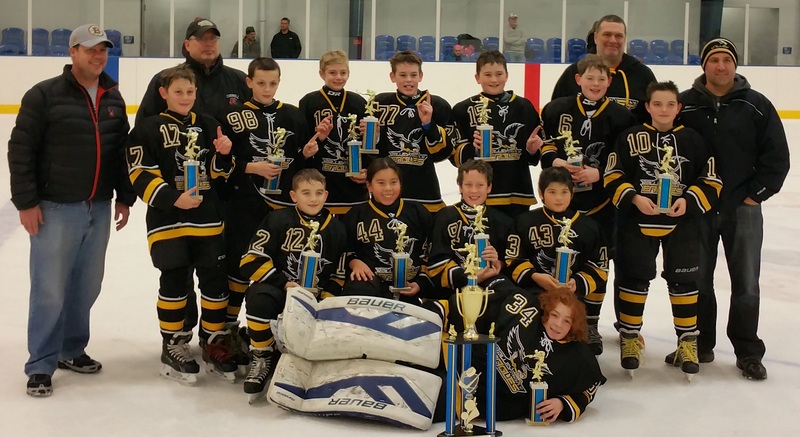 "The Squirt House-Graf team won a hard-fought tournament this weekend in Rome, NY. After an undefeated series of games, the team went on to the Championship game. They found themselves down 3-2 in the bottom of the third period. 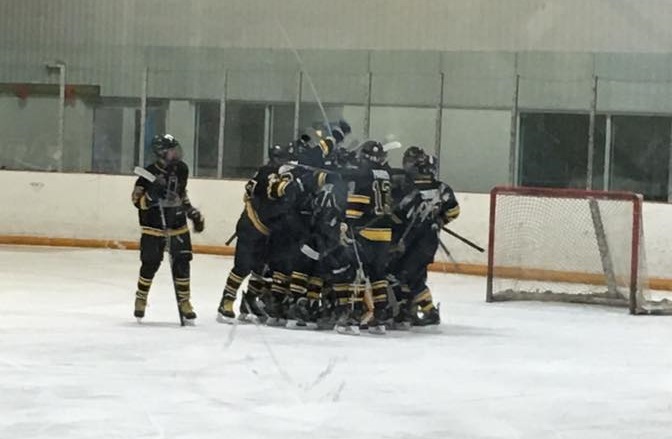 With 6 seconds left, the team fought back and tied 3-3 -- and a short two minutes into sudden death, scoring the first goal to take home the 2015-2016 Silver Stick Championship!" Valley Peewee-Pelsue & Whitestown White 2 Team Up! The Valley Peewee Red team (Team Pelsue) joined the Whitestown White 2 team in bringing a little bit of Joy to some less fortunate kids in the area by donating to Toys for Tots on Sunday December 13 in New Hartford. 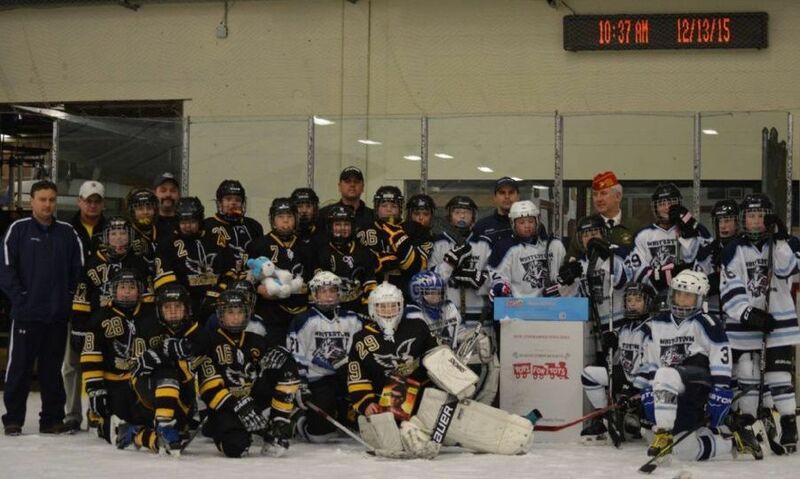 Each player from both teams brought a toy to donate and the toys were presented to Daniel Berkhoudt, Commandant (Edward L. Smith Jr. Detachment 245 of the Marine Corps League), a representative of Toys for Tots, on ice after the game. 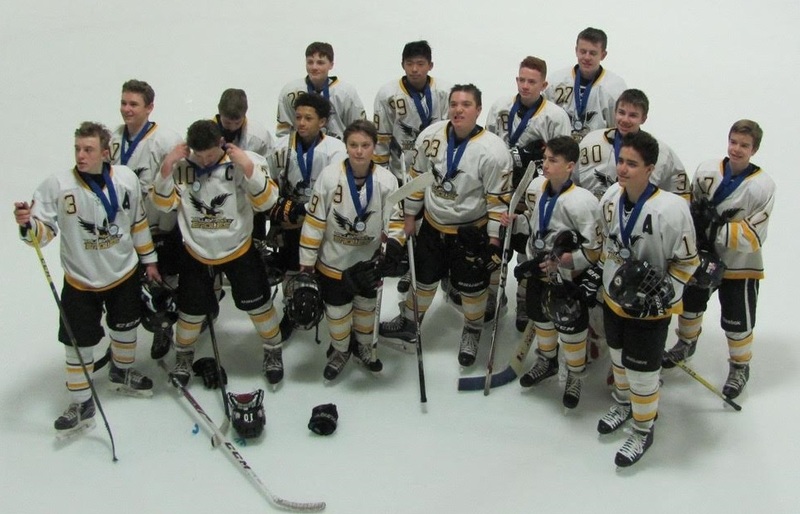 Bantam Travel Wins SYHI Tournament! 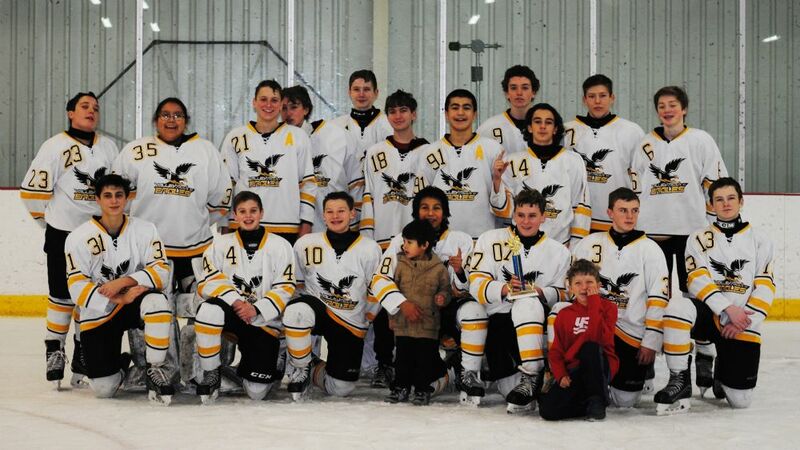 Congratulations to Valley's Bantam Travel team for winning the Saratoga Youth Hockey Bantam Tournament, "A" Division! 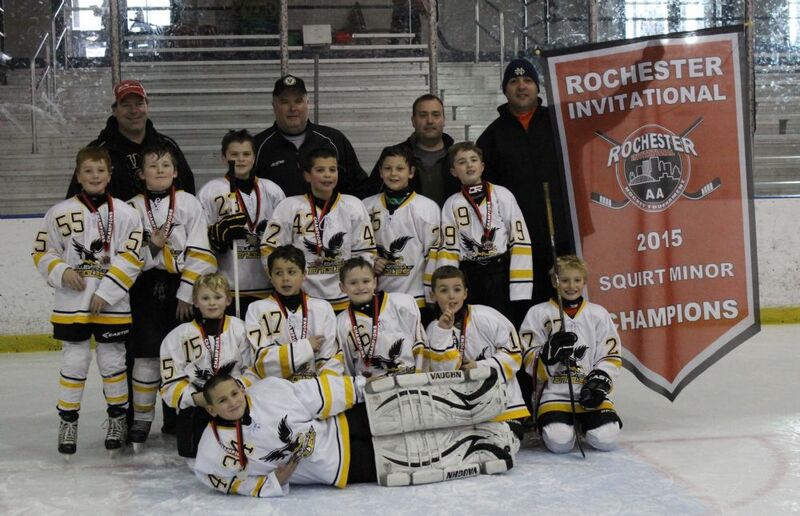 Squirt Minor (06) Wins Rochester Invitational! 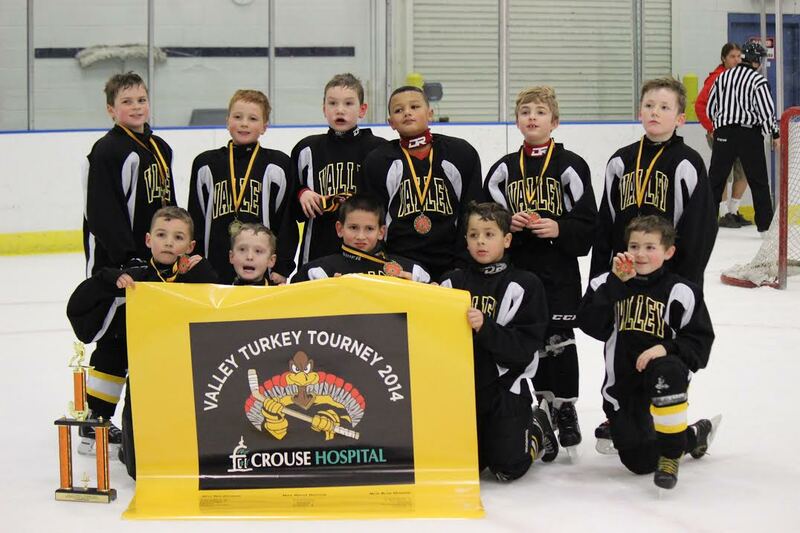 Valley's youngest travel team defeated the Hamburg Hawks twice to take the championship in this past weekend's tournament. Kudos, squirts! Another Successful Turkey Tourney -- Thanks! 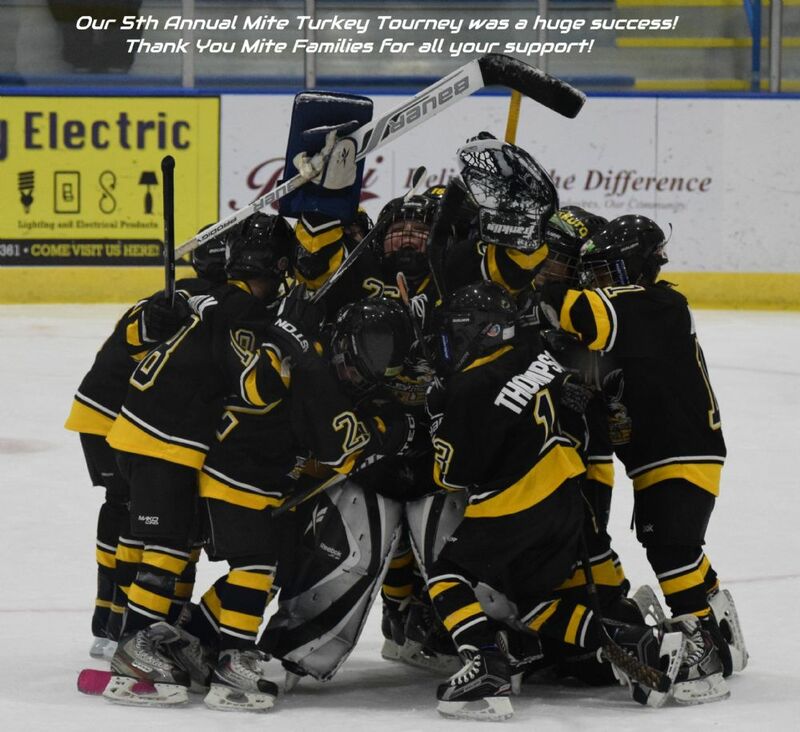 Our 5th annual Mite Turkey Tourney was a huge success. Thank you Mite families for all your support! And, a special thank you to the Turkey Tourney Committee for all their hard work. 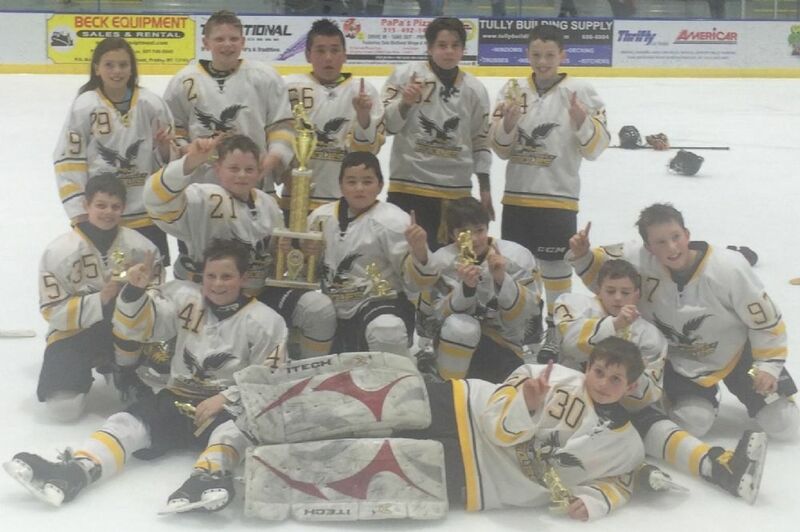 Peewee Minor Wins Gene Harrington Shootout Classic Tournament! It was a tough slog, but the boys kept working and their efforts paid off. Congratulations, Peewee Minor! 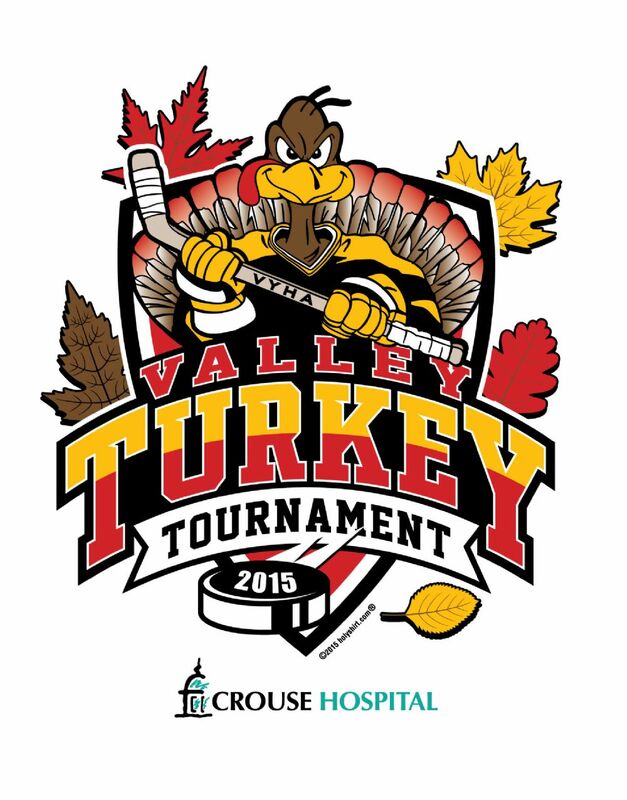 Crouse Hospital Presents... Turkey Tourney 2015! Valley Hockey's 5th Annual Turkey Tourney will take place on Saturday and Sunday (Nov 28th & 29th) during the Thanksgiving holiday weekend. 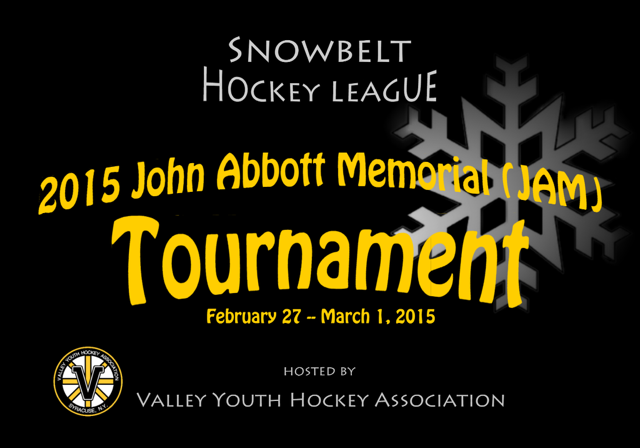 More than 250 6-8-year-olds will be playing hockey at this tourney! 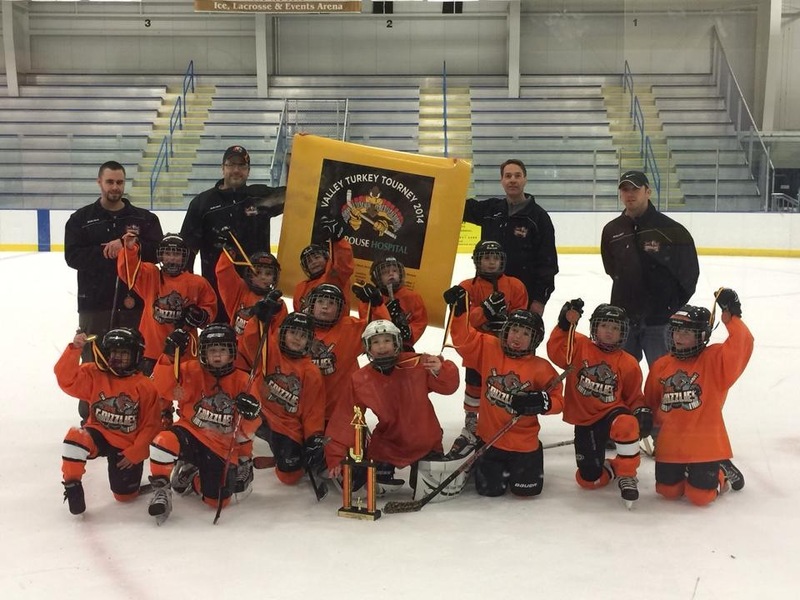 Presented by Crouse Hospital, this Mite festival will include teams from Camillus, Center State, Lysander, Midstate, Onondaga, Oswego, Rome, Skaneateles, Utica, and Valley. The Red and White teams will be playing for a position in a Consolation or Championship game, while the Blue teams will play 6 cross-ice games in a mini-jam format. The tourney will be held at the Onondaga Nation Arena and Meachem Rink. Brackets, locations, and times will be posted on our website. There will be raffle baskets and tasty home-made food available at the Nation rink. The Onondaga Nation Arena's excellent snack shop & Meachem kitchen will be open with many food & beverage choices, too. Many thanks to Crouse Hospital's generous sponsorship of this very fun tourney! Crouse Hospital's mission is to provide the best in patient care and to promote community health. The hospital serves as the official sports medicine hospital of the Syracuse Crunch and is the official hospital of Syracuse University Athletics. In operation since 1887, Crouse serves more than 24,000 inpatients, 70,000 emergency services patients, and more than 150,000 outpatients a year from a 16-county area in Central and Northern New York. Crouse is Central New York's largest provider of maternity care services, delivering more than 4,000 babies annually, and is the designated regional referral center for high-risk neonatal intensive care services. Other areas of specialty include comprehensive diagnostic and interventional cardiac care; neurosciences; orthopedics; internal medicine; surgical services (including the latest advancements in robotic surgery); and the region's only hospital-based chemical dependency treatment services for adolescents, adults and seniors. 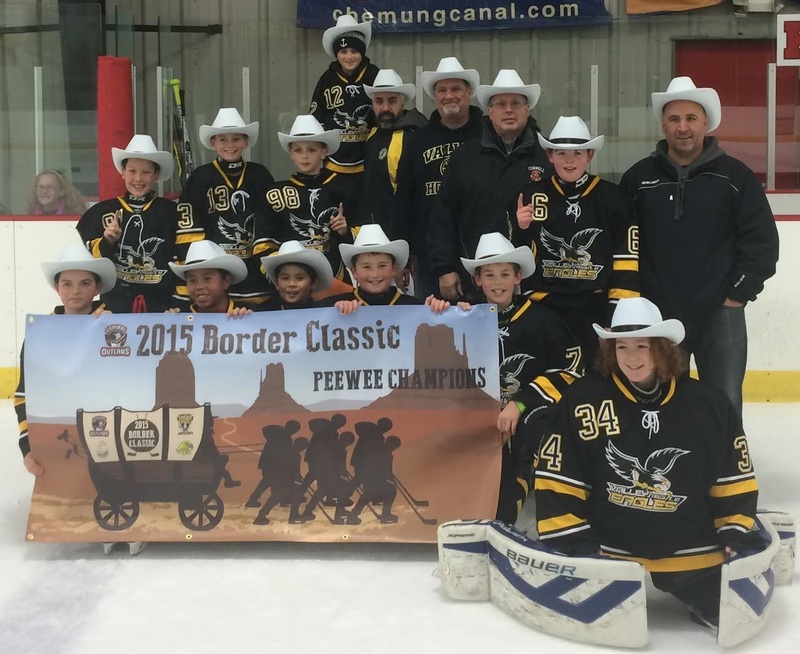 Peewee Minor Wins Central Outlaws Tournament! 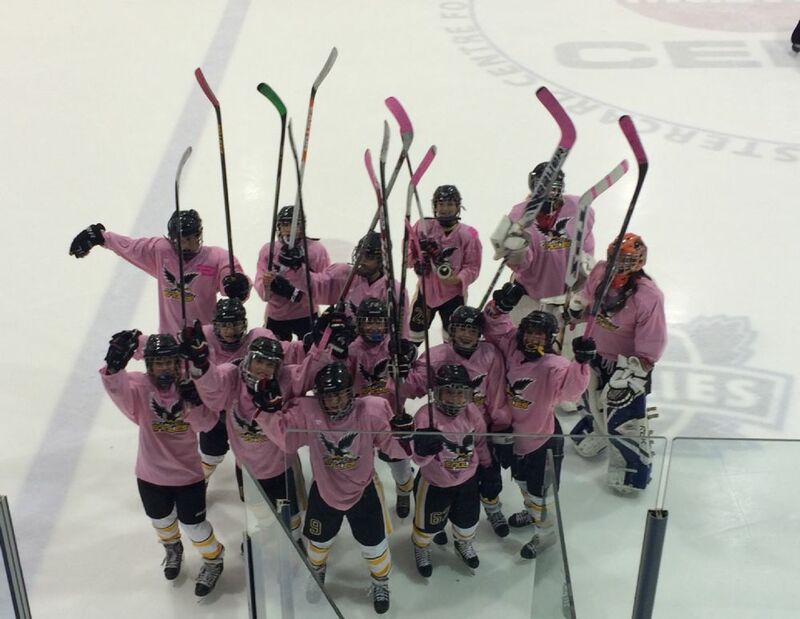 The Girls 12U team competed in Toronto this past weekend at the Etobicoke Pink The Rink Tournament, which raises funds for Canadian breast cancer charities. The girls won 3 games and lost 1, which is impressive against the caliber of the competition -- the highest level of Canadian girls hockey. Kudos, girls! 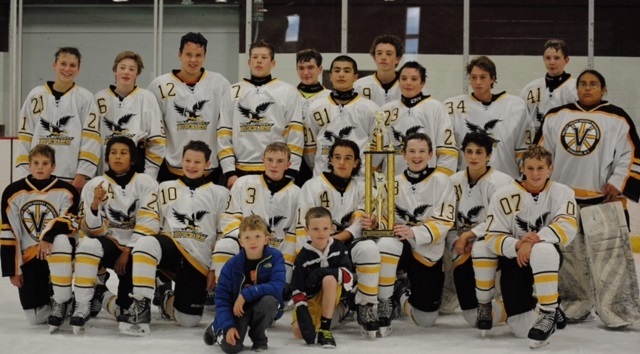 Bantam Travel Wins Valley Bantam Fall Invitational! We are reaching out for your help in our efforts to find much needed community support for our Association. Specifically, we need to identify businesses who would be willing to provide support to VYHA through sponsorships and advertising to help us to continue offering our youth hockey program at affordable fees. This support is needed given the higher ice costs which we began to incur in 2014. Further, the Board has approved team revenue sharing, to teams who successfully bring in sponsors (see link below). We believe the support can not only benefit our Association but also local businesses through greater exposure of them to all who come into contact with our association. Identify businesses that you feel would be interested in sponsoring VYHA via team/league and tournament(s) or advertising i.e. Dasher board or Banners or in Tournament brochures. If you are aware of a potential supporter please identify a contact person. Agree to volunteer on the VYHA Sponsorship committee which would entail working with the committee on contacting business to support VYHA and its annual events. This season we are hosting 4 in-season tournaments in addition to the Snowbelt JAM Tournament and we will be looking for advertising in the Tournament program(s) as well as items for raffle baskets. We are also considering publishing a Yearbook in which we will be offering advertising opportunities. The Onondaga Nation is looking for Sponsors to purchase advertising space on their Dasher boards and Banners which benefit VYHA through a direct reduction in our Ice costs. It’s our hope that successfully gaining the support of our local business community can become an ongoing annual supplement support mechanism for our youth hockey program. 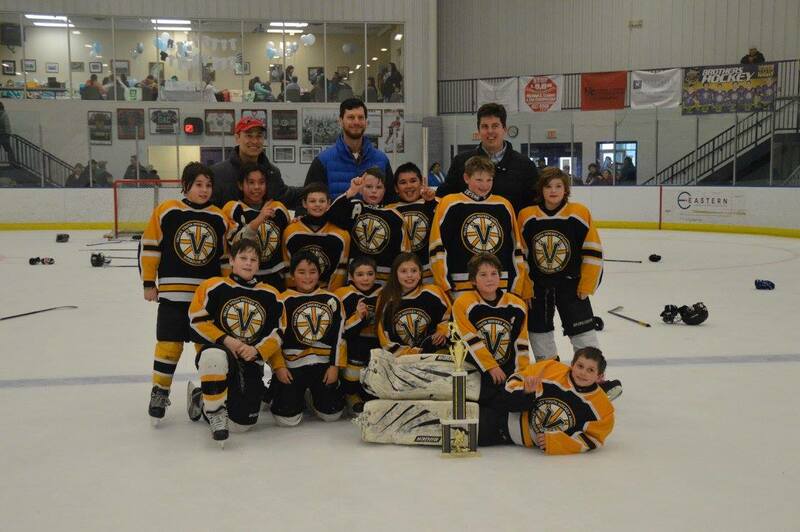 Congratulations to Valley's Mite Red team for winning the Syracuse Mite Invitational tournament this past weekend! 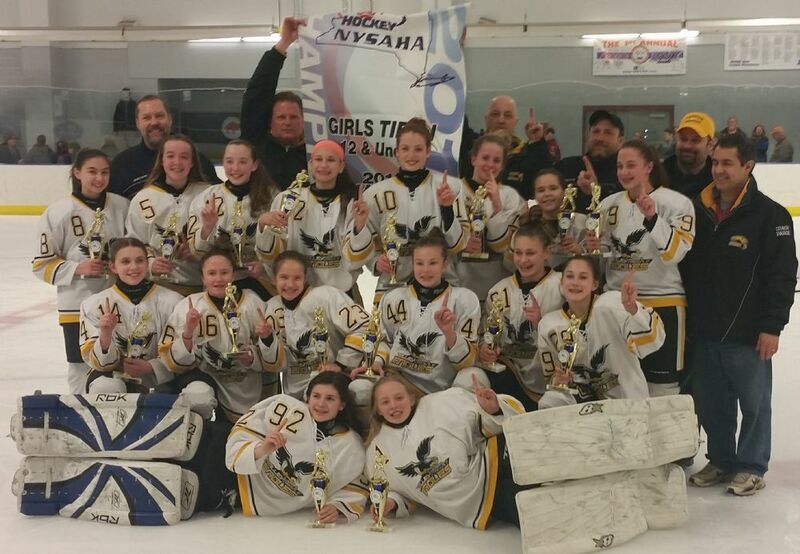 Valley Bruins 12U girls won the Tier One State Championship today in Rochester. The girls were undefeated in tournament play! Congratulations to the girls and the dedicated coaches! 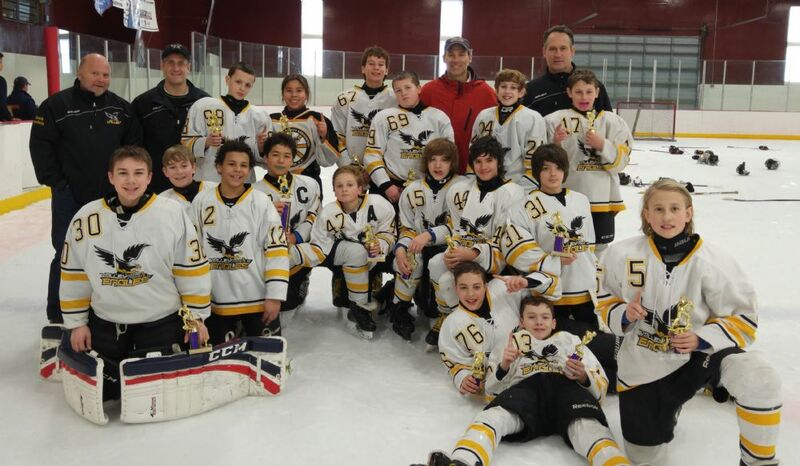 Congratulations to Squirt '05 for winning the Valley Hockey March Meltdown Tournament! Thank you to all of the teams who participated. 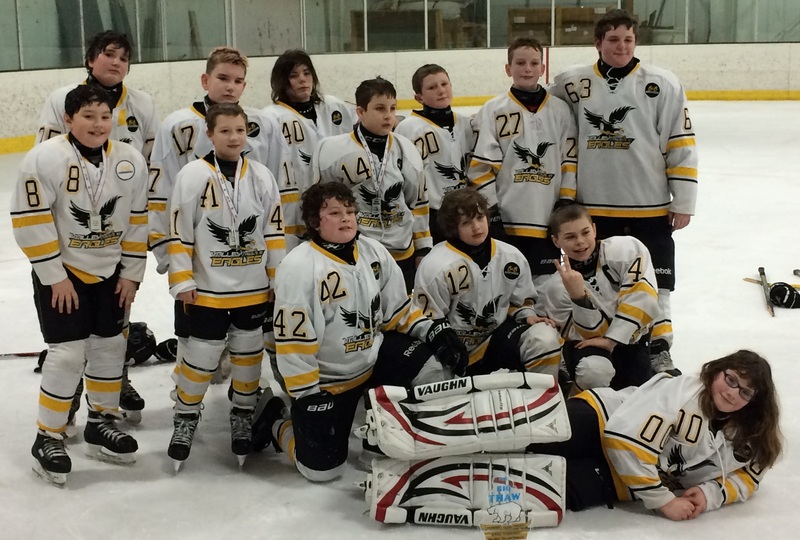 Every team played hard -- it was an impressive bunch of young hockey players! 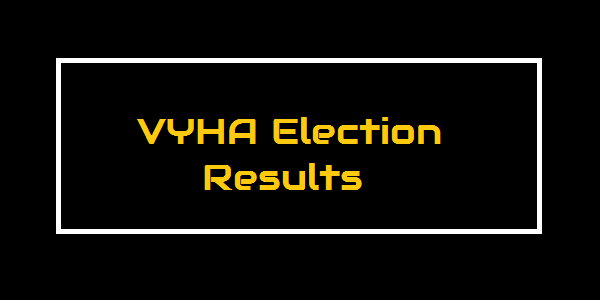 *Elected members of the VYHA Board of Directors (President, VP, Treasurer, Secretary, Dir of Coaches, Dir of Referees, Scheduler and At Large Members) are not eligible for the award. Appointed Directors are eligible. Valley is hosting a Squirt Minor Tournament this weekend. We need some volunteers for two Sunday games that will be held at Meachem. We need a scorekeeper, clock operator and concession help. If you’re available to volunteer for either game, please let Mike Donlin know at or 315-317-0192. 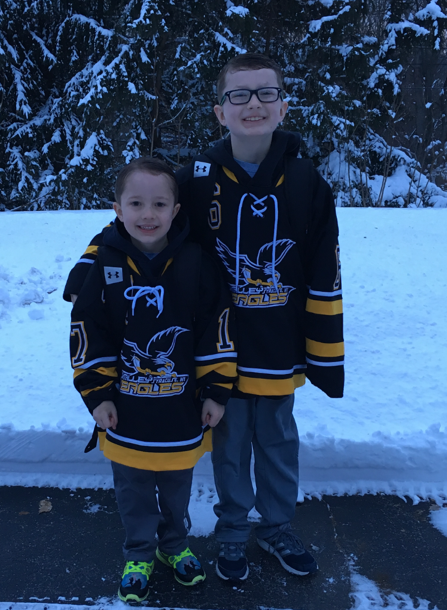 It seemed like 6 games in 4 days, nearly 6 hours of pond hockey in below zero temperatures, toboggan rides down a 30 foot ski jump out onto a frozen lake and gondola rides to the top of a mountain wasn't enough excitement for the Valley Peewee Travel team. So they went through 2 overtimes and a shootout to bring home the championship of the Lake Placid International Tournament this weekend. Valley scored on their first 2 shots in the shootout and Cal Hill stopped 2 out of 3 shots to claim the championship. 10 different players scored goals in the 6 games and it was truly a team effort that lifted them to the championship. Congratulations to the Squirt White 2 team!! 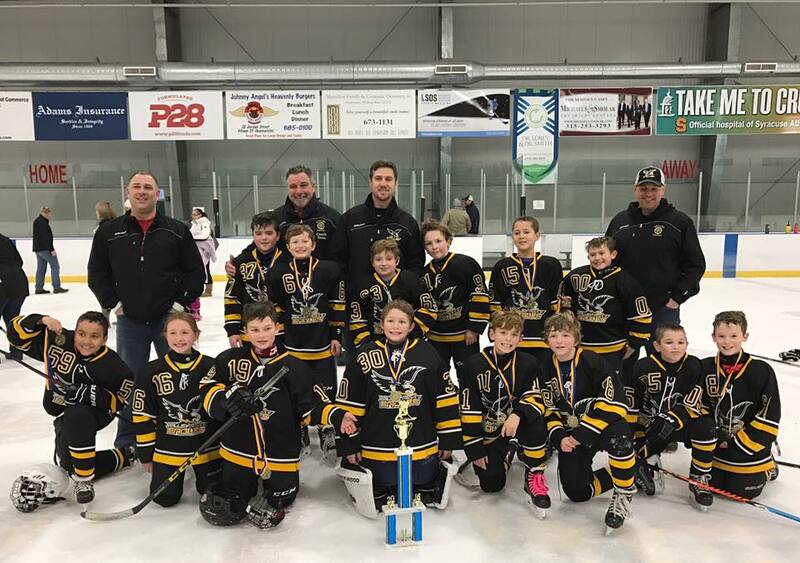 Congrats to Valley's Mite Red team, 1st place champions in the Skaneateles Mite Fest! Squirt White 2, Pee Wee Blue, and Bantam Blue are all hosting tournaments this weekend, February 27-March 1 at Meachem Rink and Tsha'Hon'nonyen'dakhwa' (Onondaga Nation Arena). Volunteer opportunities are STILL AVAILABLE! Click HERE to see the list. ANY parents who are not traveling this weekend are encouraged to help out! You need to have a password and sign-in to actually sign up. If you don't yet have a password but you definitely have an email registered with us (if you receive notifications about your child's schedules at your email address), all you have to do is to click on the "Get a Password!" link on the home page and follow instructions. 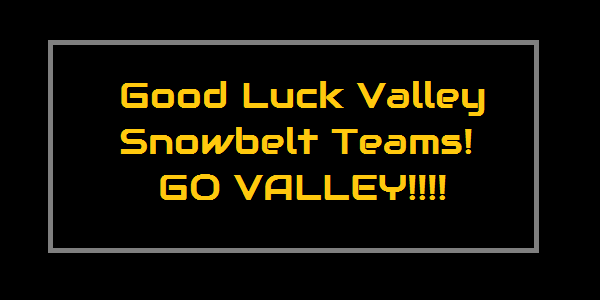 Good luck to all of our Snowbelt teams this weekend! GO VALLEY!!!! 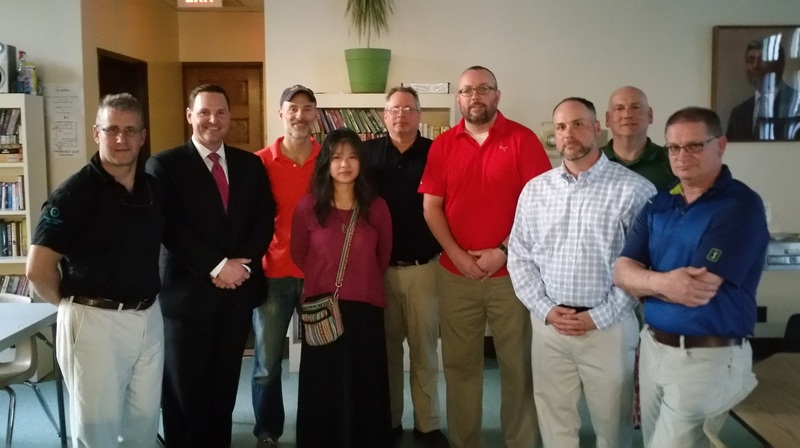 Welcome to our visiting Snowbelt teams! 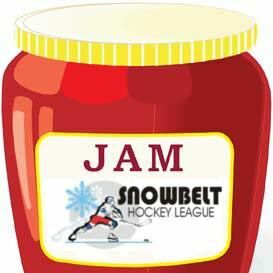 Links to schedules, rules, and directions to the rinks can be found on our Snowbelt JAM Tournament page which you can find HERE. Contact information for the tournament coordinators is also posted there. Please make sure valuables are not left unattended in the locker rooms because there have been thefts reported at some area rinks. Valley Squirt 04 Wins Game at War Memorial! 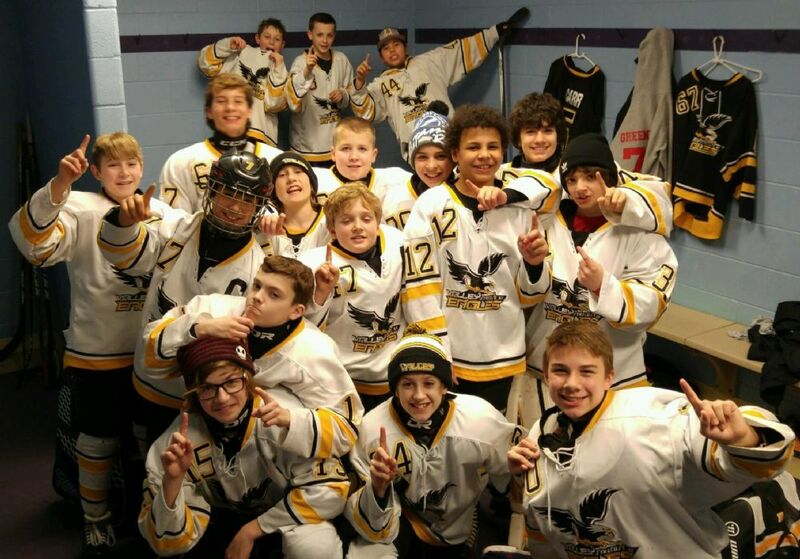 The 04 squirts not only got to experience playing at the War Memorial this past Saturday, but they won their game, too! It was the second game of the day with the Massena North Stars who traveled almost 3 hours to Syracuse and still had the energy to tie Valley for the first game and score the first few goals of the second game. Both games were nailbiters! Thanks to Massena for visiting! And thank you, Syracuse Crunch, for the wonderful experience!! The squirts were thrilled to play at the War Memorial and to hear their names announced, especially when they scored! Everyone enjoyed watching the Crunch play that evening, also. 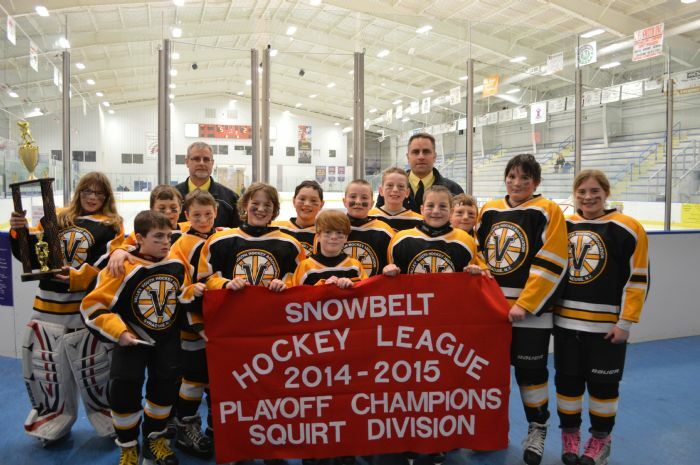 The video of the Valley Squirt 04 v. Massena game (game 2 at War Memorial) is posted HERE. Fabulous action photos by Heather Buff can be viewed HERE. 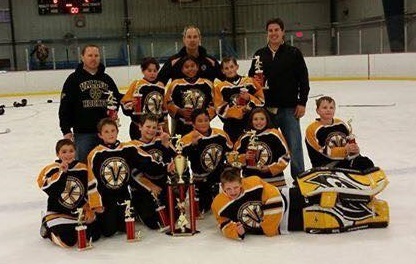 Valley PeeWee White Wins Center State 2014-15 Invitational! 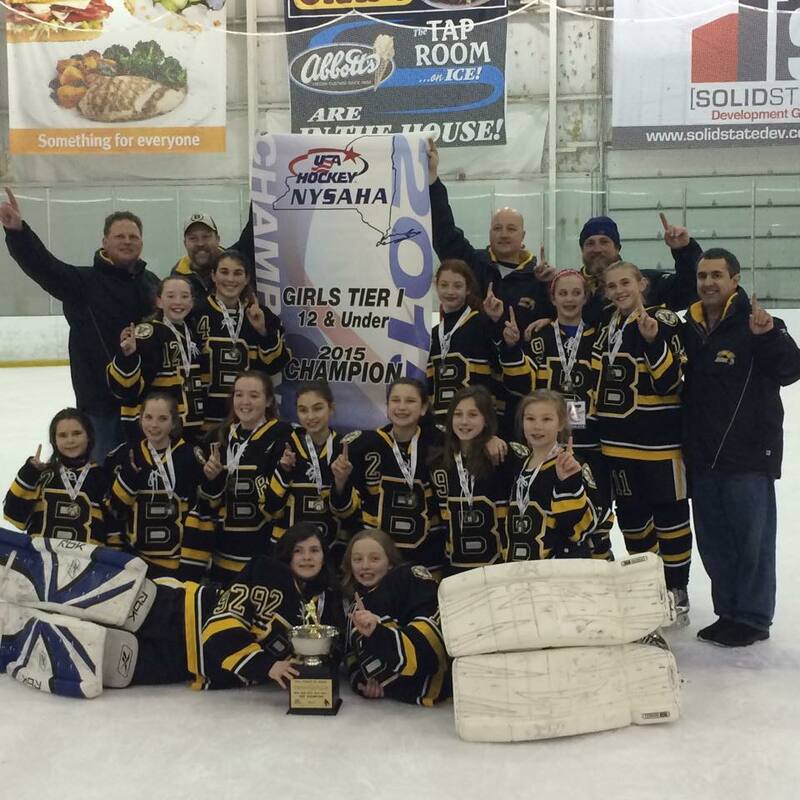 The odds were never in their favor, but the Squirt 04s emerged as champions! For more information, please contact Dave Ogden at or 263-5336. Valley Girls 12U Travel Team (Tier 1) wins York Lady Devils MLK Tournament! In Coach Mucha's words: "We won in the championship game this morning 4-0 vs the Lady Islanders Girls 12U Travel team. The goalies split the game for shutout. We outshot them 25-8. The girls played well all weekend and only allowed one goal in four games. Our goalies are Maddy Erno and Breese Burlingame. Our goals were scored by McKenzie Schmidt, Tessa Mucha, Molly MacQueen and Macey DeOrdio. Assists went to Riley Calhoun, Molly MacQueen, Hannah Partigianoni, and McKenzie Schmidt. In fact, every player on our team scored a goal this weekend!" Congrats to the Valley Girls 12U team!!! 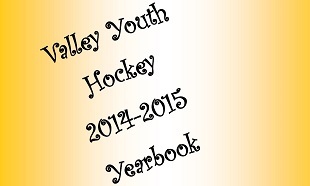 In keeping with other efforts to improve the organization and enhance the hockey experience for all of our participants, the Valley Youth Hockey Association Board has approved the creation of a 2014-2015 association-wide yearbook. We think this will be an opportunity for all to have a great memoir of their experiences this year, and a keepsake for years to come. We hope to make this a yearly tradition that will track our players’ growth from mites through midgets. Valley’s yearbook will feature team and individual action pictures from anyone who wishes to contribute them. The plan is to include photos from all of this season’s tournaments, also, so we project that the yearbooks will be available shortly after the season is complete. However, NOW is the time to get your cameras out and start getting some great shots of your players, if you have not been doing so already! We will communicate additional information on how to submit photos soon. We are in the process of forming a yearbook committee. Anyone interested in becoming a valued member of the yearbook committee, or willing to contribute in any way – please contact either Audra Pelsue or Mary Pat Walsh as soon as possible so we can get the ball rolling! Winners of Valley's Turkey Tourney 2014! Valley Hockey's 4th Annual Turkey Tourney will take place on Saturday and Sunday, November 29 & 30, during the Thanksgiving holiday. 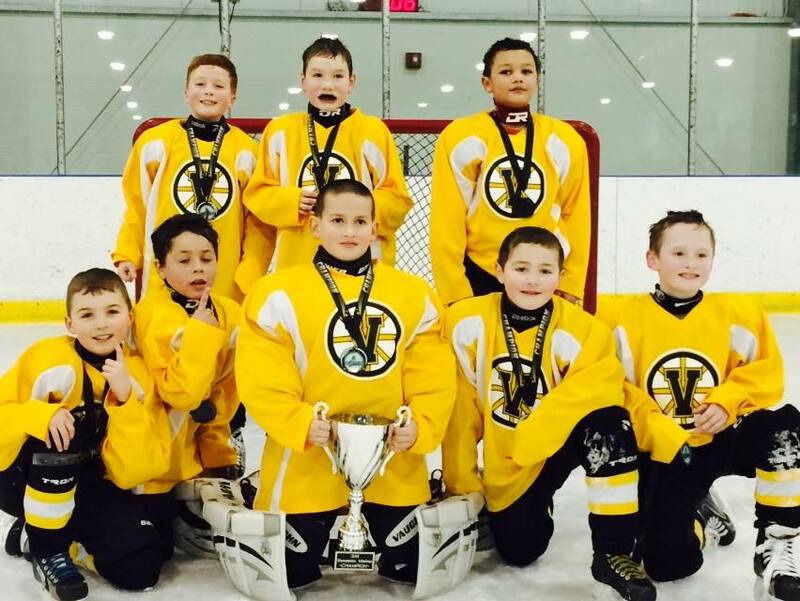 More than 200 6-8-year-olds will be playing hockey this weekend! Presented by Crouse Hospital, this Mite festival will include teams from Camillus, Lysander, Midstate, Rome, Skaneateles, Utica, and Valley. The Red and White teams will each play 4 half-ice games, while the Blue teams will play 6 cross-ice games. 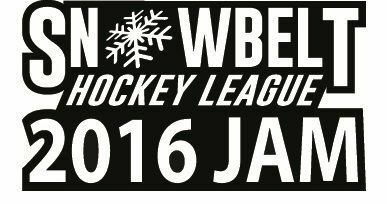 The tourney will be held at the Onondaga Nation Arena and at Meachem Rink. Brackets, locations, and times will be posted on our website. There will be raffle baskets and tasty home-made food available at both rinks. The Onondaga Nation Arena's excellent snack shop will also be open with many choices! Crouse Hospital's mission is to provide the best in patient care and to promote community health. The hospital serves as the official sports medicine hospital of the Syracuse Crunch and is the official hospital of Syracuse University Athletics. In operation since 1887, Crouse serves more than 24,000 inpatients, 70,000 emergency services patients, and more than 150,000 outpatients a year from a 16-county area in Central and Northern New York. Crouse is Central New York's largest provider of maternity care services, delivering more than 4,000 babies annually, and is the designated regional referral center for high-risk neonatal intensive care services. Other areas of specialty include comprehensive diagnostic and interventional cardiac care; neurosciences; orthopedics; internal medicine; surgical services (including the latest advancements in robotic surgery); and the region's only hospital-based chemical dependency treatment services for adolescents, adults and seniors. It isn’t life or death, as we like to think it is. It isn’t do or die as often as we pretend it to be. In one tiny moment in one elimination game, kids hockey was reduced to what it really is about: Apple juice. OK, so it’s not really apple juice. But what apple juice happens to represent in all of this. Thank you for your patience as the Valley Board has worked to secure ice for next season. I am now in a position to pass along some very exciting news. According to City of Syracuse officials, Meachem rink will be open in the fall. The anticipated opening will occur in October 2014. Here's a link to the press conference for those who are interested. We have the following people to thank for their efforts: Mayor Miner, Senator Valesky, Assemblyman Magnarelli, Councilor Dougherty, Parks & Recs Commissioner Baye Muhammad, and Deputy Commissioner John Walsh. Not to mention the countless Valley families who have dedicated their time, energies & efforts to making this a reality. It was great to hear Senator Valesky describe the efforts of our families as “One of the most significant advocacy efforts on behalf of any organization I have ever seen... 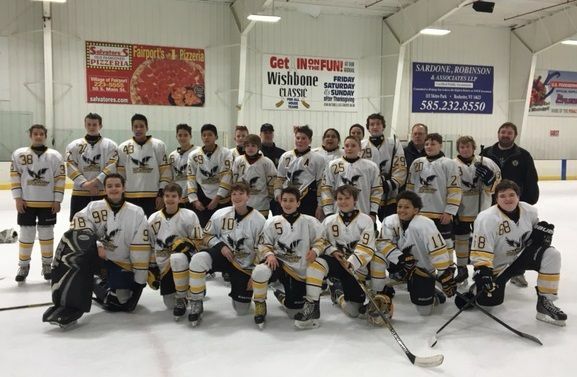 I have never seen the kind of advocacy that has taken place here in the Valley -- kids, parents, neighbors coming together; it is really remarkable.” Or, as Councilor Dougherty put it, "you know hockey parents." In an effort to ensure that Valley would have sufficient ice for the coming season in the event that Meachem did not open, the board went out and explored several contingency plans. I'm pleased to announce that we have reached an agreement with the Onondaga Nation, under which Valley will become the primary tenant of Tsha'Hon'nonyen'dakhwa' (the Onondaga Nation’s) ice rink. For anyone who has not yet been there, the Nation rink is a beautiful and well-equipped facility with ice of outstanding quality. The photo above is a view of the rink. Many of you know that with our growth over the past several seasons, Valley teams have been renting additional ice at Sunnycrest and Tennity. We have even filled several of our programs, including First Strides, to the point that registrations have had to be capped. By securing more ice time at Tsha'Hon'nonyen'dakhwa', we can ensure our growth won't be limited by ice time availability. The board & I feel this is an exciting time for Valley Youth Hockey. Our program is thriving and growing. Having two rinks will open up many possibilities for us. We are planning to expand on multiple levels. Some ideas that have been presented are to enhance our initiation program by introducing a non-competitive league where boys and girls can practice and play games for a four to six week period. We hope to open the sport to more players in general and open up hockey opportunities to city kids and the Onondaga Nation kids who've been reluctant to try it in the past. We’d like to explore having weekly clinics with high caliber coaches to focus on power skating, shooting and puck possession. Other plans include invitational tournaments, 3-on-3 tourneys, girls programs, expanding the number of house teams and fine tuning our travel teams to effectively compete at their appropriate levels. More players, more fun! I’m sure many of you will have questions, so please feel free to ask by replying to this email. 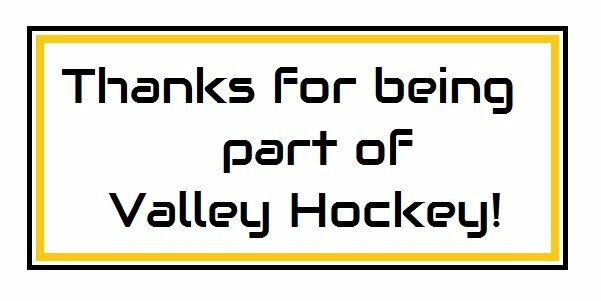 We’ll add a “Frequently asked questions” post on the Valley Hockey website page based on the questions that come in; see FAQs here. We will also send another email out with more details that follow from the news above. In closing, I'd like to again express my sincerest thanks to all of you who made this possible. It was a great relief to me to have a dedicated group of folks who were willing to roll their sleeves up & get the work done. It is appreciated more than I can express. Q: What is Valley Hockey? 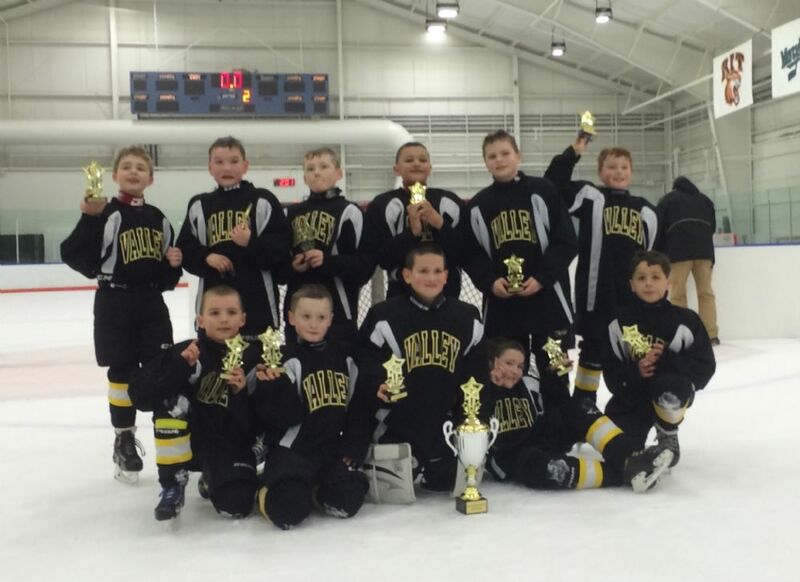 Valley Youth Hockey Association (VYHA) is a organization in the Syracuse, NY area that provides boys and girls ages 4-18 with an opportunity to learn to skate and to play ice hockey at recreational and competitive levels. 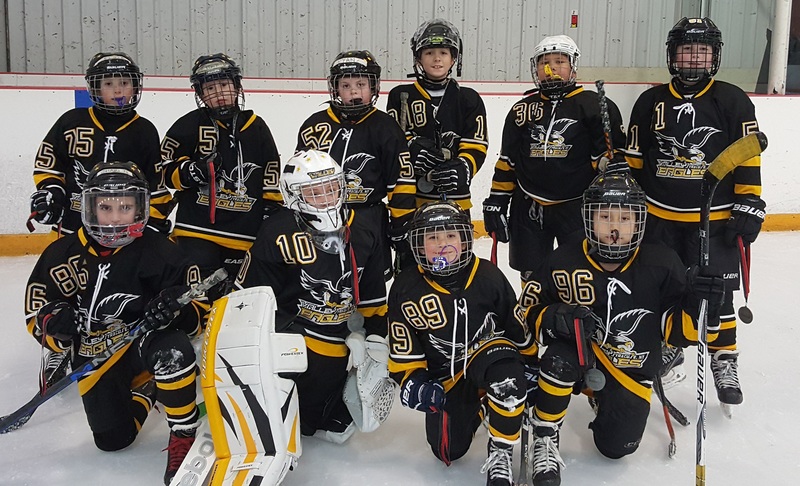 VYHA’s mission is to be the premier community-based USA Hockey Association in Central New York, supporting and encouraging the growth of youth hockey amongst a diverse membership. Q: Why do parents choose Valley? 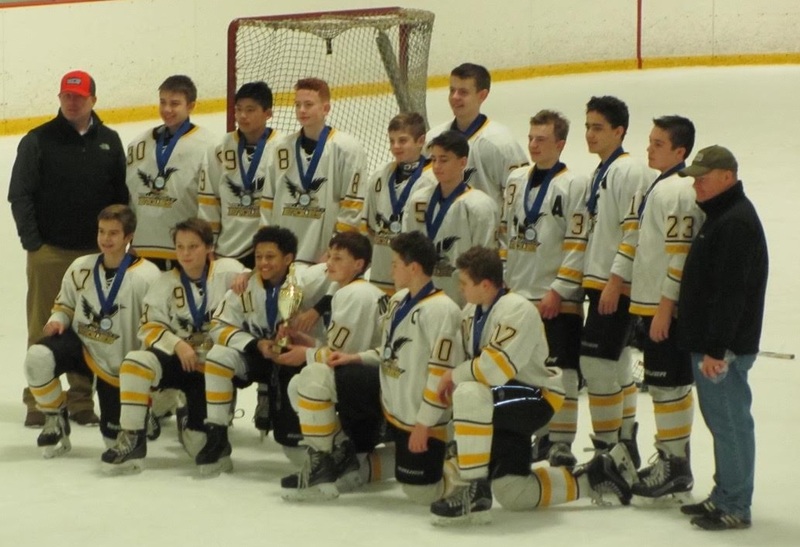 Valley is an all-volunteer organization dedicated to delivering the best possible program to provide fun and friendship, as well as the opportunity to develop serious hockey skills. 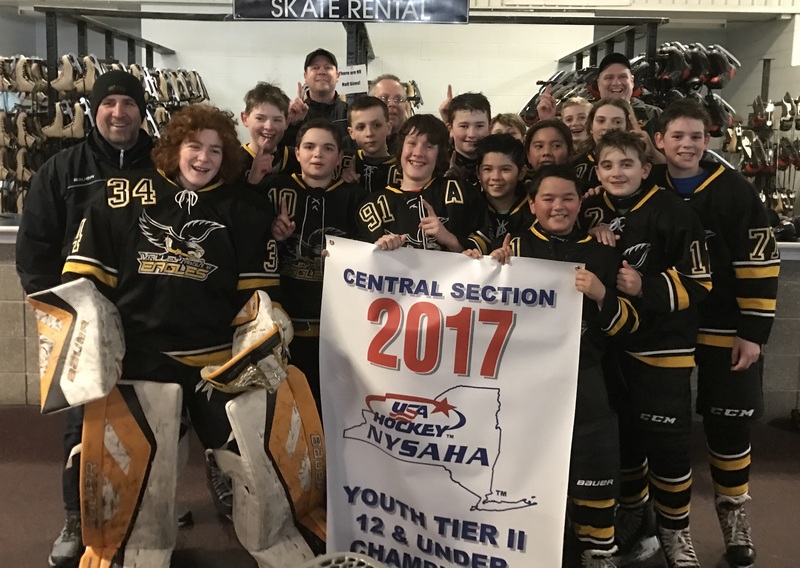 The organization is one of just a few that have been recognized by the New York State Amateur Hockey Association for their exemplary adoption of the development recommendations put forward by USA Hockey and the NHL. 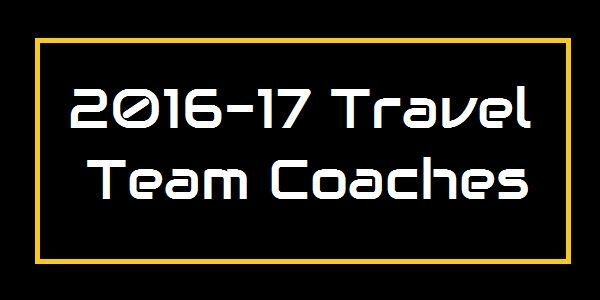 The organization is growing because of its qualified coaches, kids-first focus, competitive success and unparalleled value. Q: I saw something in the news about technical trouble at the Meachem rink. Does Valley have ice for next season? Yes. The problems have been addressed and Valley will have ice not only at Meachem but also at the the Tsha'Hon'nonyen'dakhwa' (Onondaga Nation) arena. Q: How is it that Valley will have ice at the Onondaga Nation arena? During the period that the future of Meachem was uncertain, the VYHA Board was advised by the city to look for ice elsewhere. Once discussions had begun with the Onondaga Nation, the potential of renting this outstanding facility from a strong partner was compelling enough that the Board decided to contract for a significant block of ice. Q: So Valley will have two rinks next year? How will this amount of ice be used? 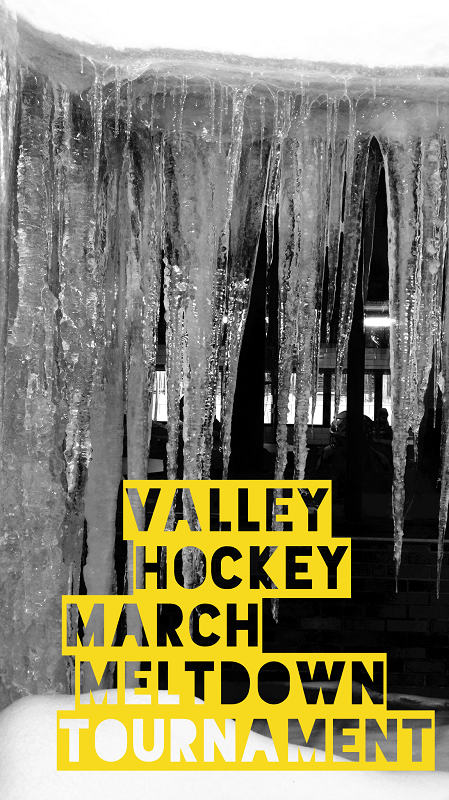 Valley prides itself on making efficient use of ice in order to provide plenty of development time at a great price. Even so, due to growth in recent years, Valley has had to rent ice at rinks other than Meachem (ex. Sunnycrest). Between the ice we have secured at the Meachem and Onondaga Nation rinks, Valley will have about 1.5 rinks' worth of ice in the coming season. This is the right amount of ice to provide ample ice to each team, to accommodate growth in the number of players and teams, and to make room for the expansion of several development programs. Q: What new or expanded development programs are envisioned? For one thing, the new arrangement will give Valley the scale necessary to fully implement the USA Hockey / NHL-recommended development program for the 6-and-under age bracket. (Valley will be the first program in the area to achieve this; Valley has already become one of just a few organizations in the state recognized for its implementation of the development program at the Mite level in general (8-and-under)). In addition, expansions are now being planned to Valley’s program of clinics (power skating, shooting, puck possession, etc. ), invitational tournaments, alternative-format tournaments (ex. 3-on-3, 4v4 -- contact for details), the girls program and more. Q: Which rink will be Valley’s “home rink”? Both; Valley will practice and play its home games out of two rinks. Q: Will recent developments and these expanded programs have an impact on fees? Ice costs have gone up this year at many local facilities, including the Nation and Meachem rinks, and unfortunately a cost increase is unavoidable. Fees for the upcoming season will be posted soon. Online registration information will be on the website starting the second week of July. In-person registration will be held at Onondaga Free Library (4840 W Seneca Turnpike) on August 6 from 6-8pm, and at the Onondaga Nation rink on August 20th from 6-8pm. Boys and girls between the ages of 4 and 18 living in the Central New York area. Q: Can parents be involved as coaches, team managers and so on? Yes. Valley is an all-volunteer organization and roles such as coach, team manager, board member and so on are available to every parent. To coach, it is necessary to fulfill the requirements set forth by USA Hockey and VYHA. More information is available at registration. Q: With Valley renting Tsha'Hon'nonyen'dakhwa', where will OYHA (the organization that rented the Onondaga Nation rink last year) be playing? OYHA will be using some of the ice that Valley has not obtained at Meachem. We understand that ice has also been made available to them at Sunnycrest. Q: So Valley and OYHA will be sharing ice at Meachem? Q: Will there be any other association sharing a significant amount of ice with Valley at Tsha'Hon'nonyen'dakhwa'? Q: Is the fact that there will be a second hockey program at Meachem good or bad for the program? On balance, we believe that this arrangement is good for Valley and good for families. The split in ice time is workable, given Valley’s success in securing ice elsewhere, and the fact that two organizations are using the same facility will provide for parent choice. In light of this, Valley’s intention is to provide the best program that we can, while continuing to be a model tenant at Meachem in terms of payment record and care for the facility. We hope for and anticipate a continuation of the respectful competition that we have enjoyed with OYHA over the last ten or so years. Q: Having practices and games at two facilities, with varying days used at one of them, may be confusing. Right. It has been suggested that we purchase a web-based, mobile scheduling solution to help prevent confusion, and this will be taken up at a future board meeting. Q: Will there be any changes at Meachem, since there will be two organizations there? Because facilities will be shared, new arrangements may have to be made for equipment storage and things of that nature. It is unclear what will happen with the kitchen; it may be that we no longer operate the snack shack. Valley signs and trophies will remain in place. OYHA has also been invited to hang signage in the facility. Q: Will Valley still have some practices at Sunnycrest? Yes; Valley will continue to rent a few hours a week at Sunnycrest. Q: What is Valley’s relationship with the city of Syracuse? Q: What is Valley’s relationship with the Onondaga Nation? The Valley By-Laws provide explicitly for favored membership not only for players from the City of Syracuse but also for players “From within the Onondaga Nation Territory.” Consequently, Nation players and coaches have been an integral part of VYHA over its forty year history. We are pleased to be entering a new chapter in our relationship with the Onondaga Nation. Q: I have a question that is not answered here. Who can I ask?